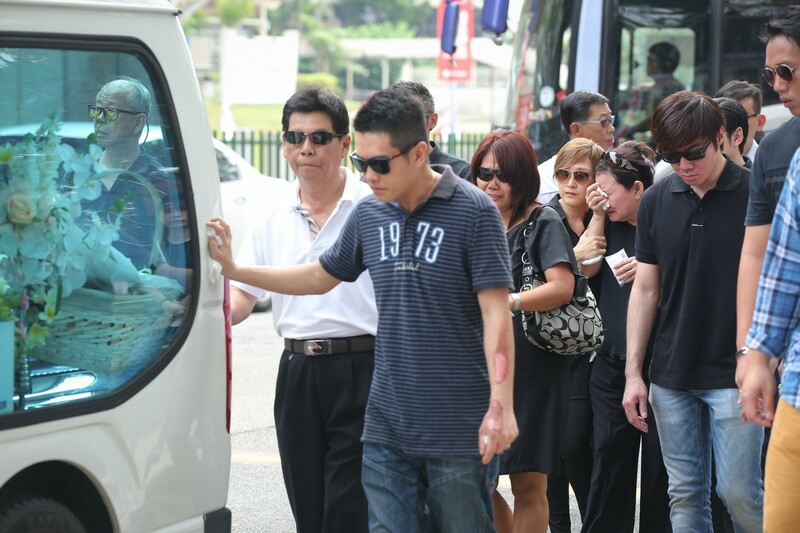 With his left arm still bearing burn scars and his right foot in a bandage, Mr Ng Su Teck came out of hospital yesterday morning to bid a final farewell to his wife, Ms Melisa Liu Rui Chun. 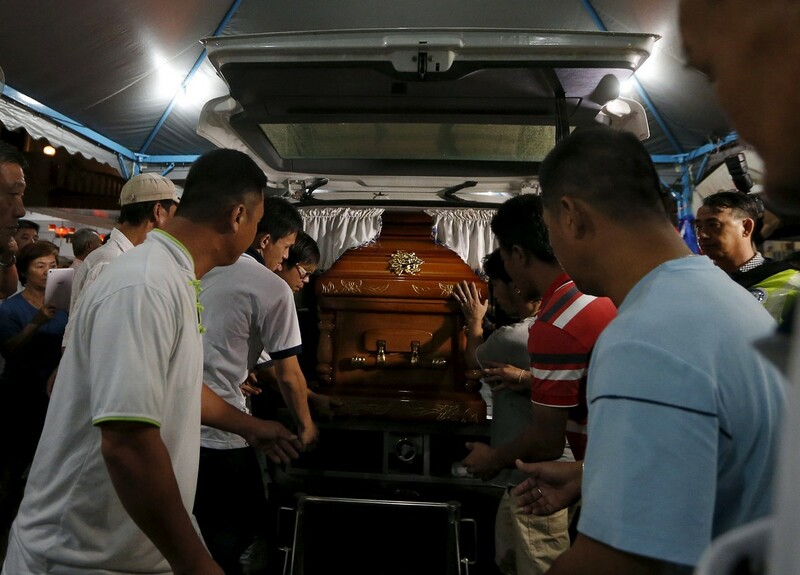 Limping towards the hearse carrying her coffin, Mr Ng, 35, who works in sales, gently placed his hand with his silver wedding band on it as her family members prepared to leave for a private church funeral at about 11am. 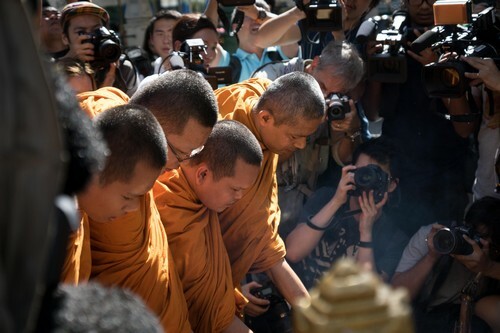 Moments later, he became distraught and had to be consoled by close friends. 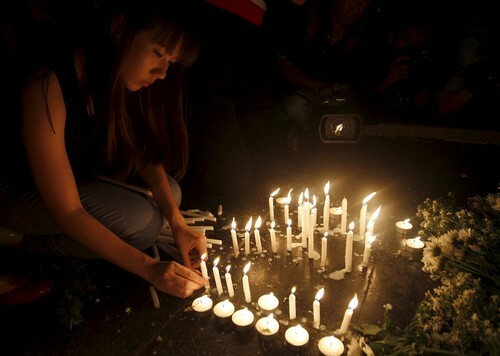 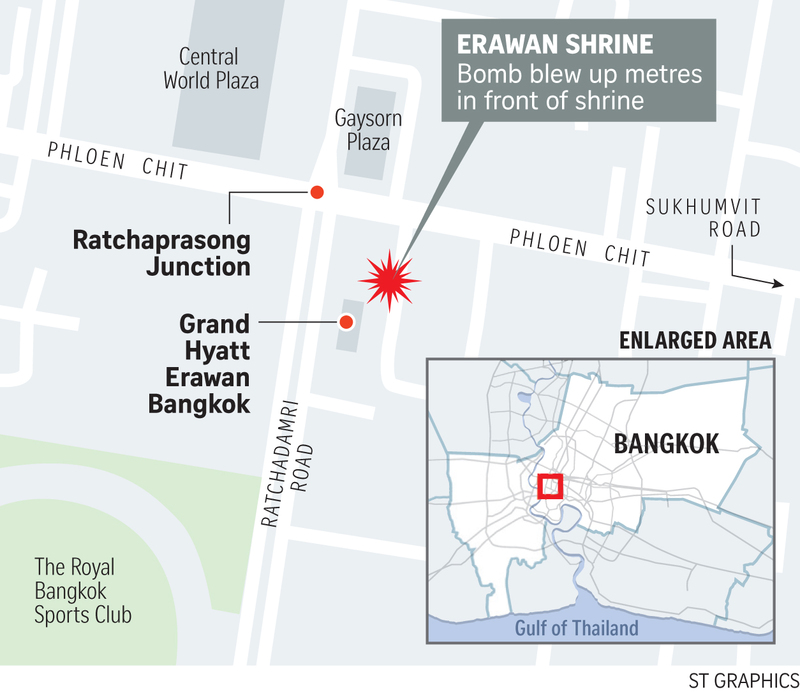 Ms Liu, 34, an employee at AXA Singapore, was killed on the spot in the deadly bomb explosion at the popular Erawan Shrine in central Bangkok last Monday evening. 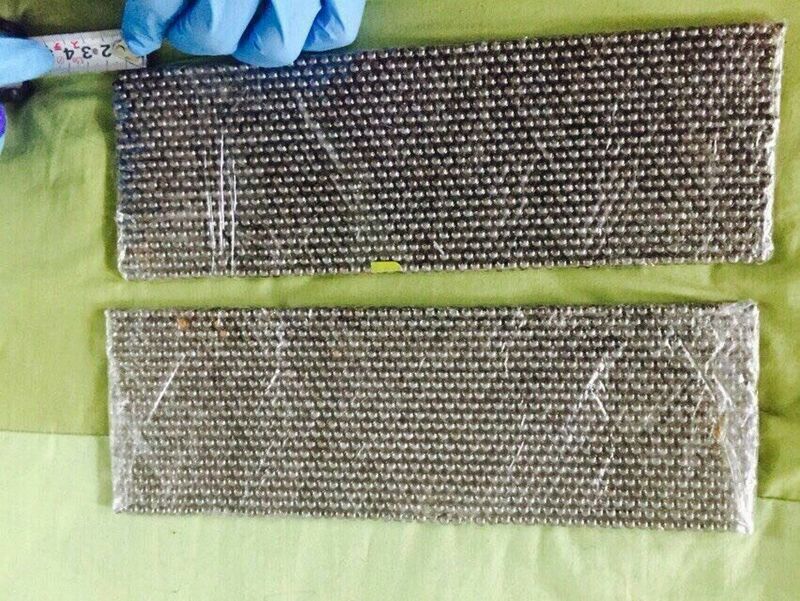 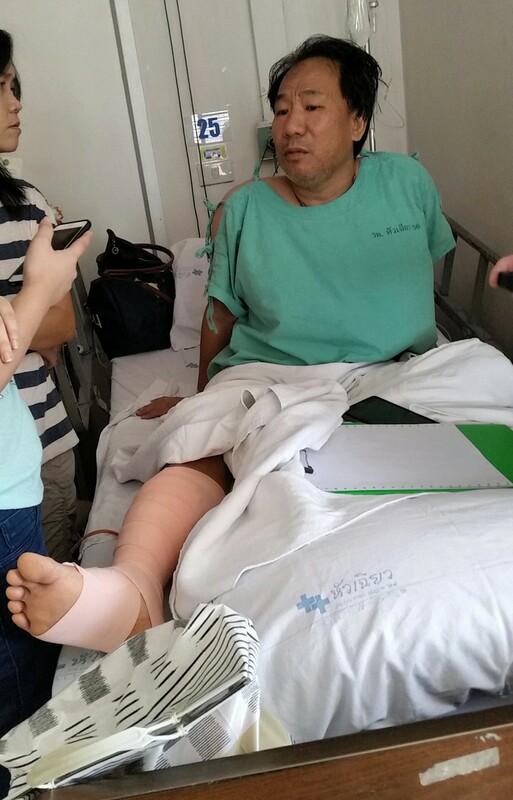 Mr Ng sustained burns and was cut by glass shards on his right leg. 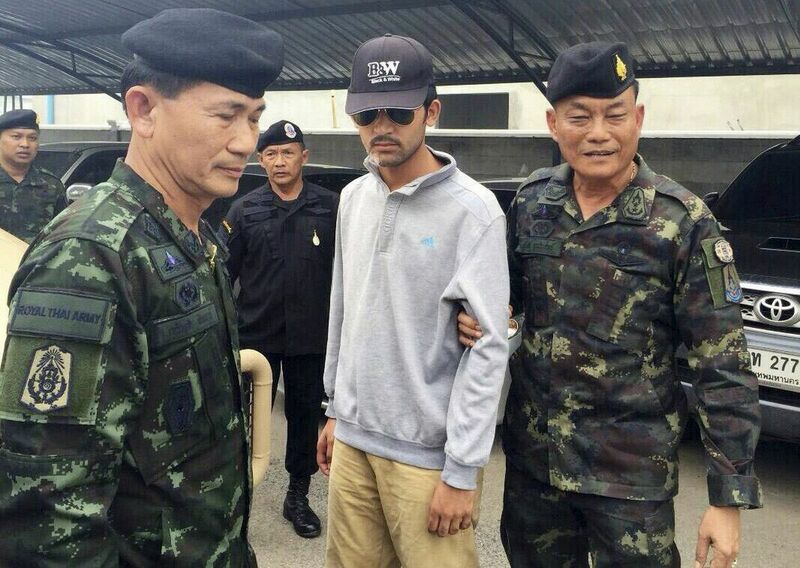 His hearing was also affected. 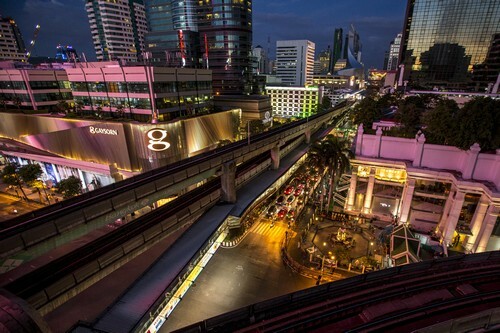 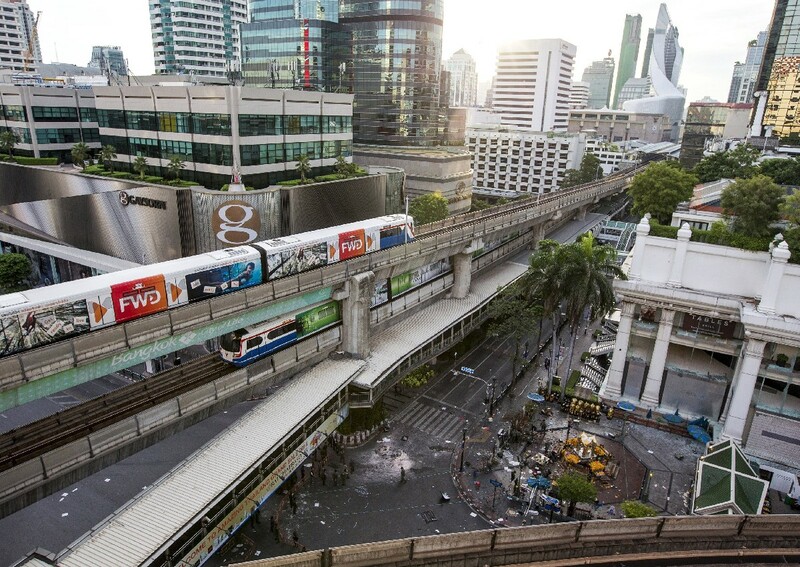 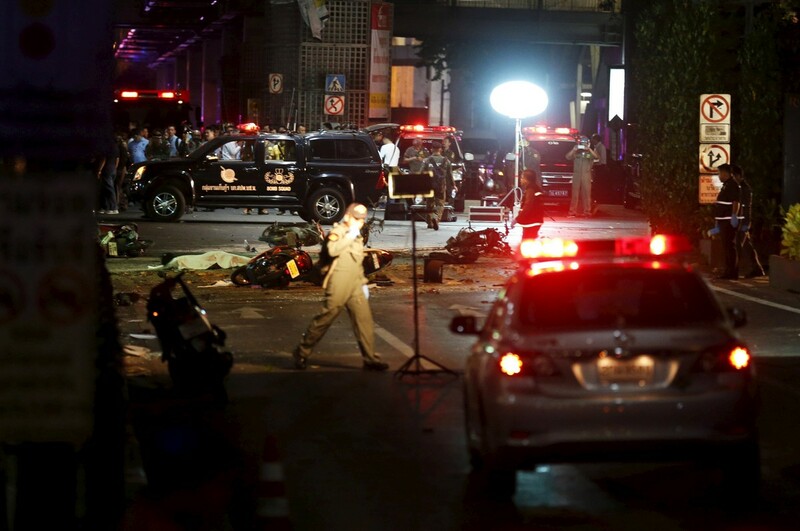 The powerful rush-hour blast occurred at the busy Ratchaprasong intersection killing 20 people, more than half of them foreigners. 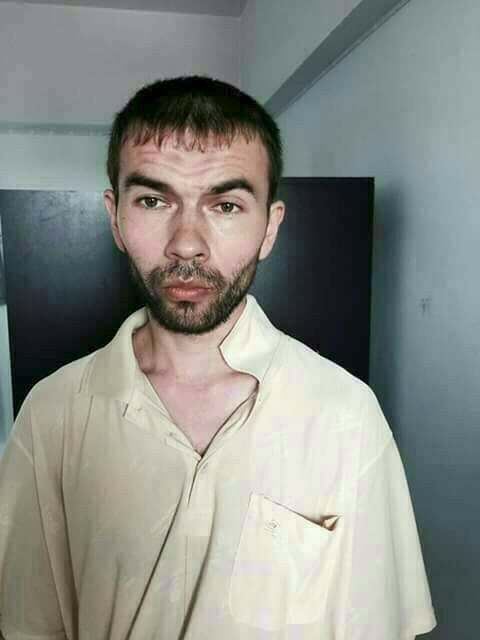 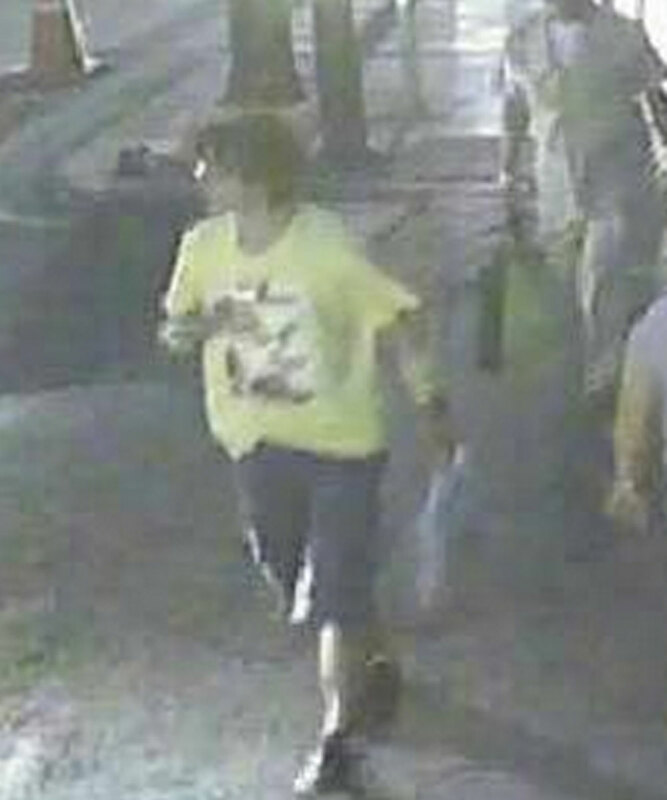 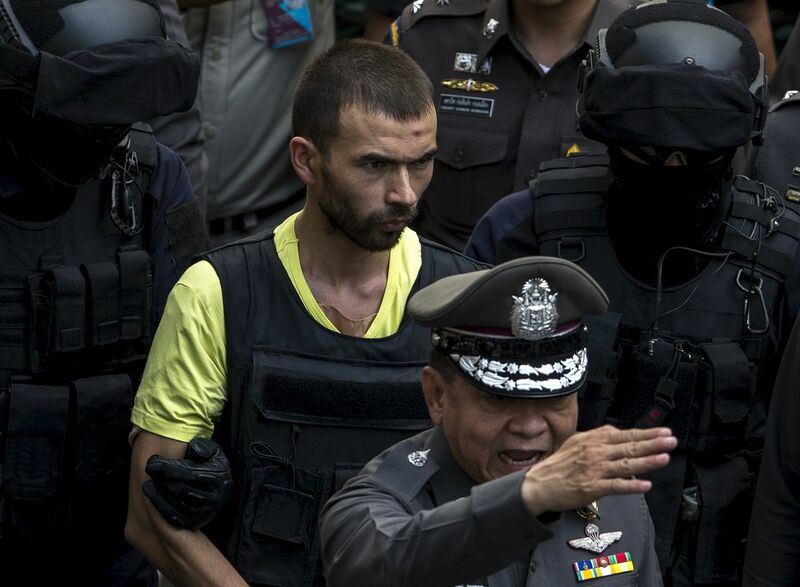 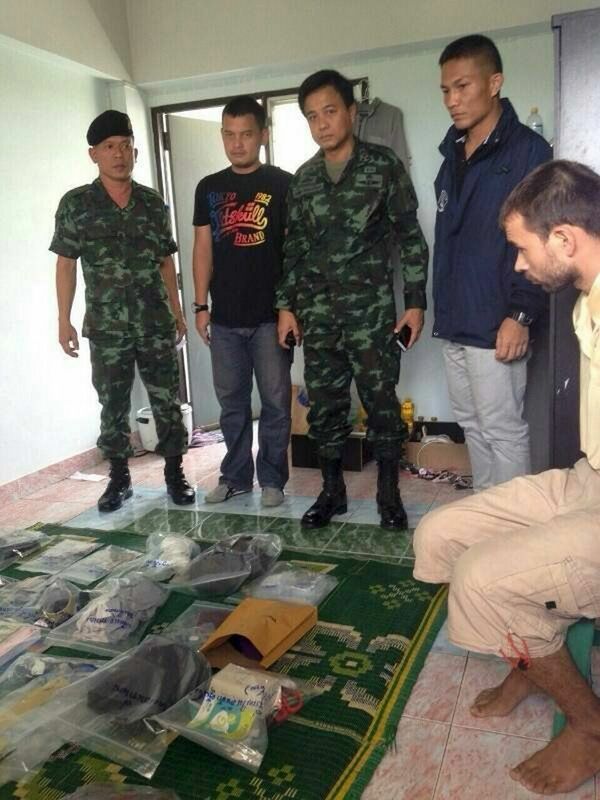 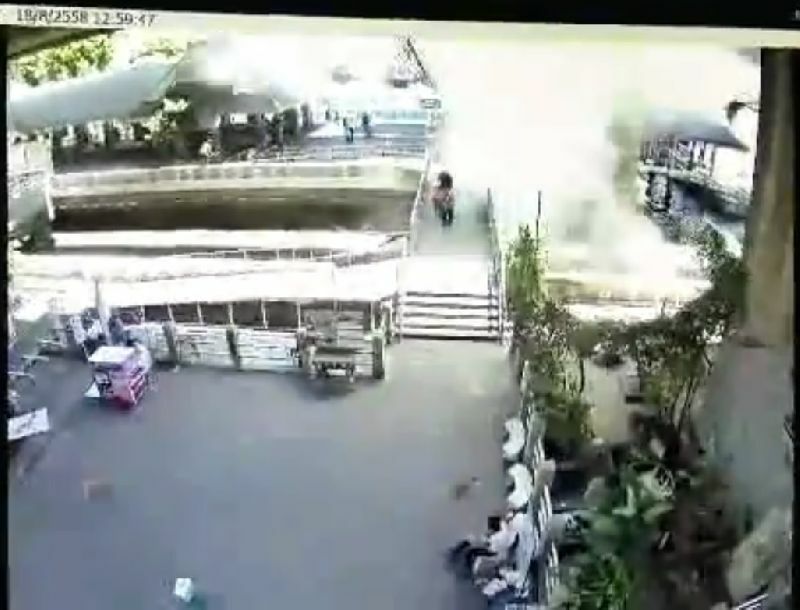 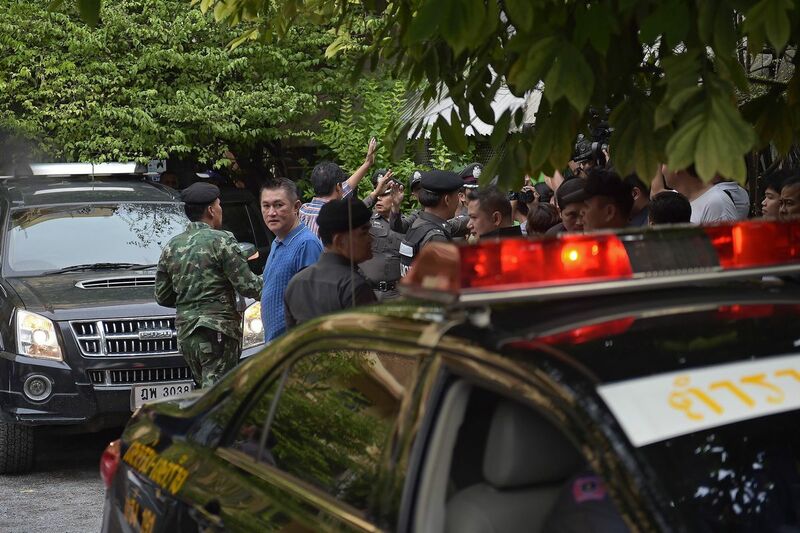 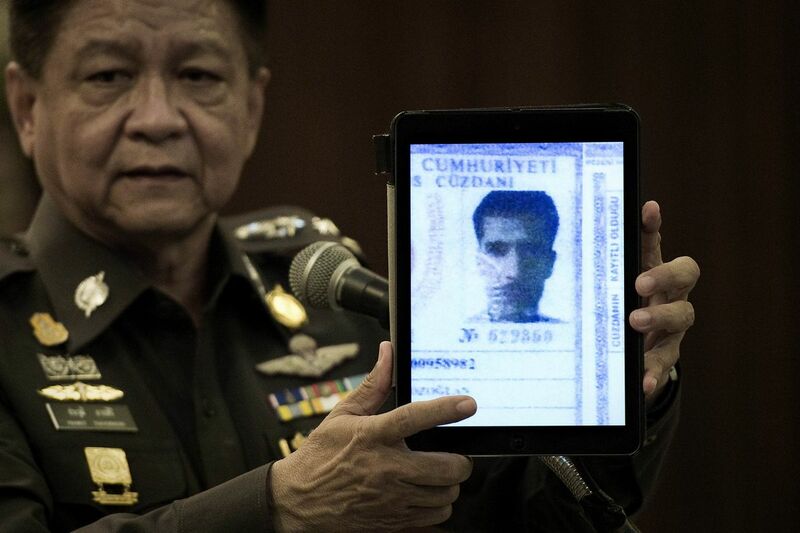 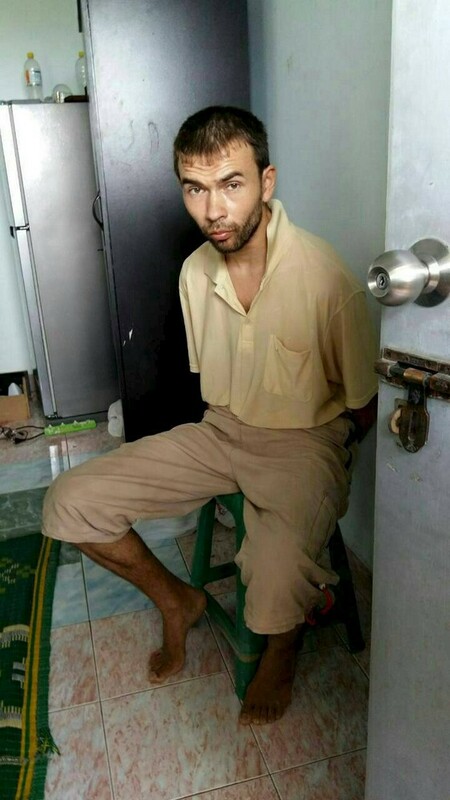 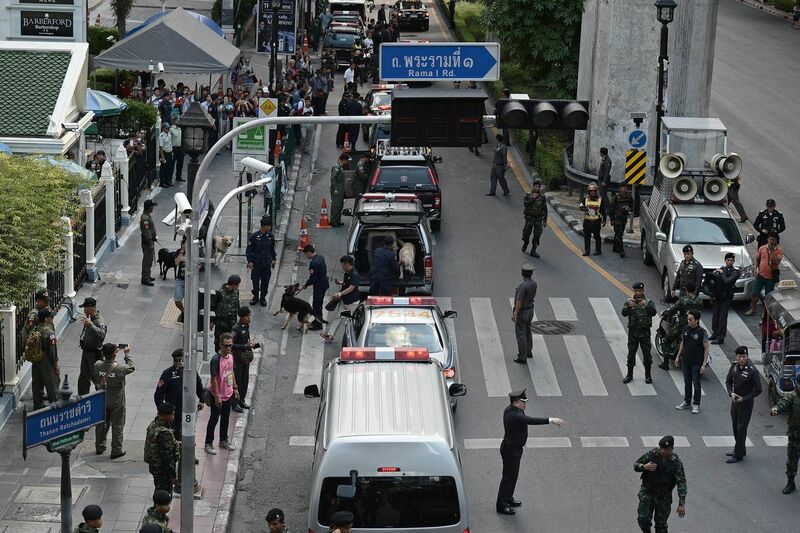 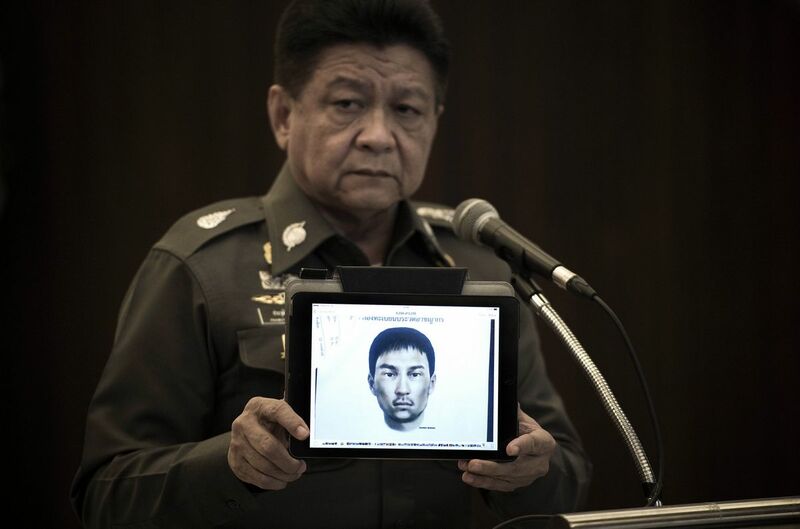 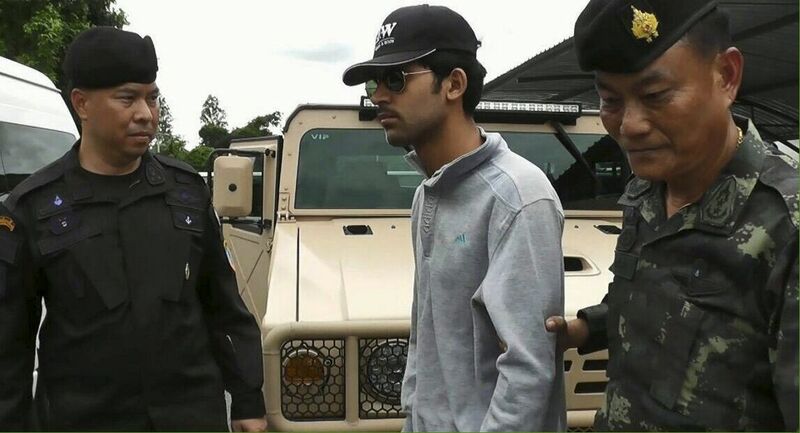 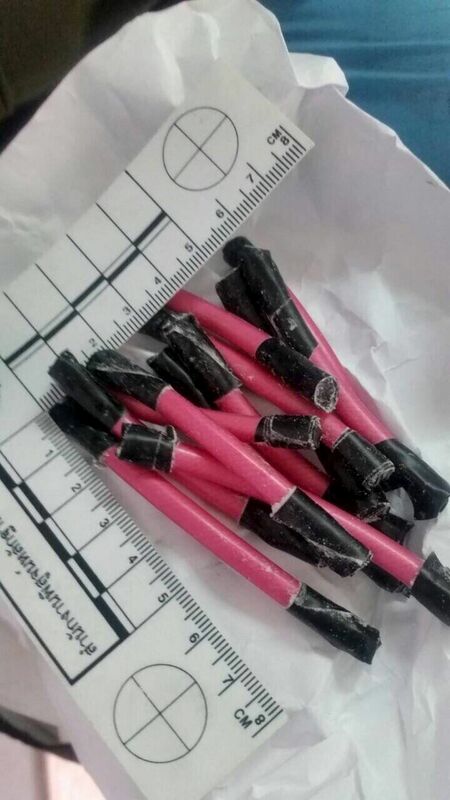 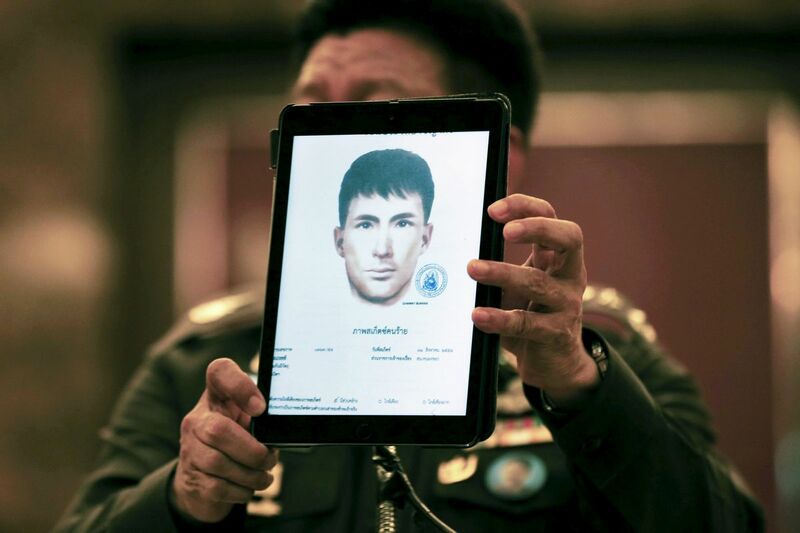 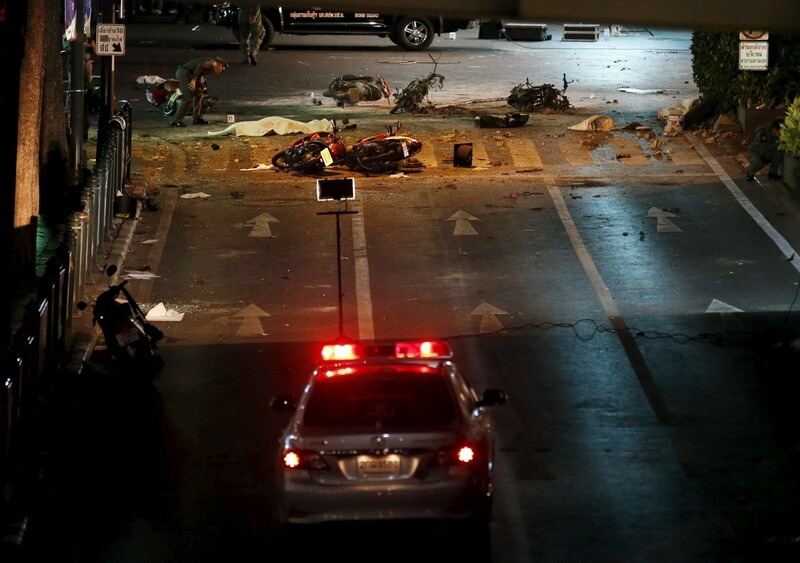 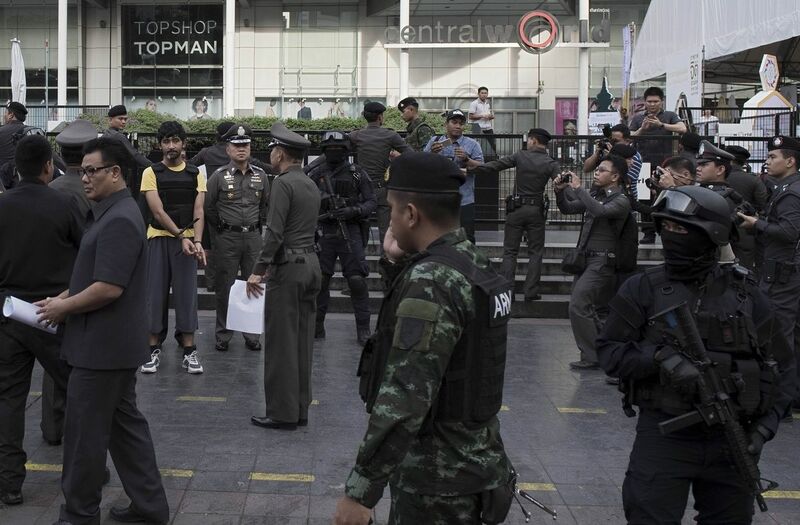 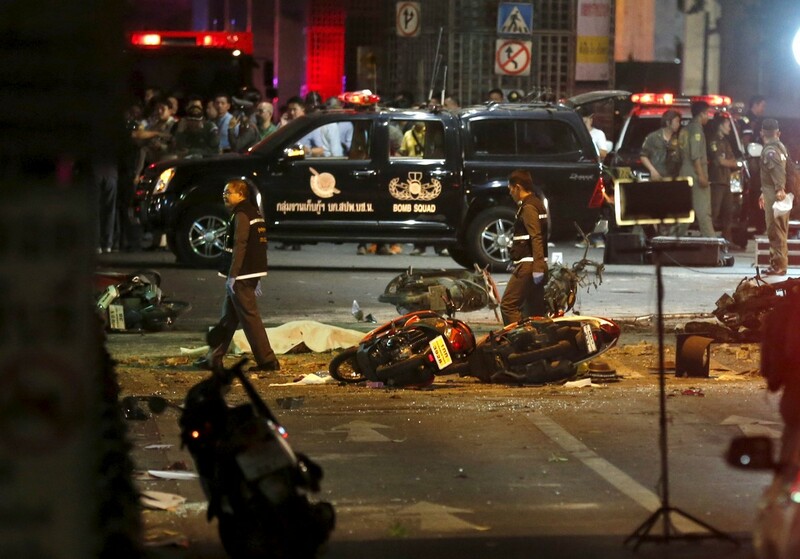 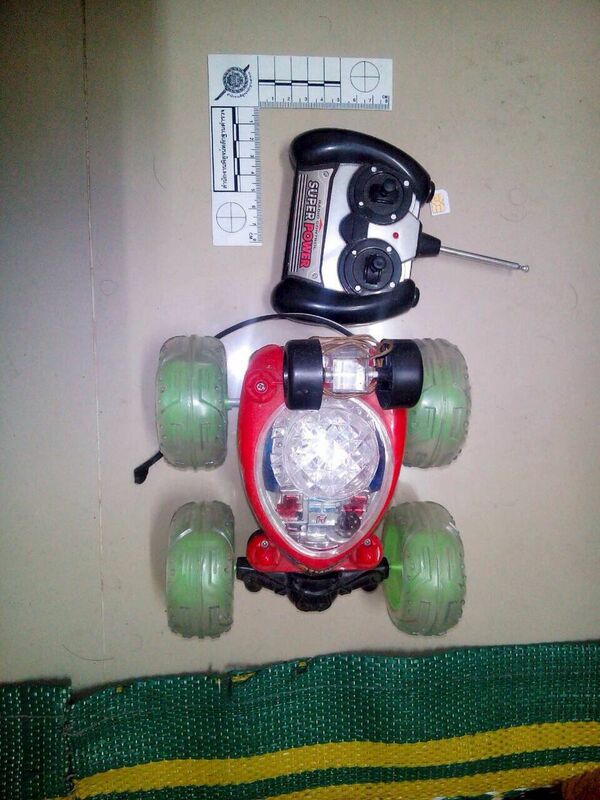 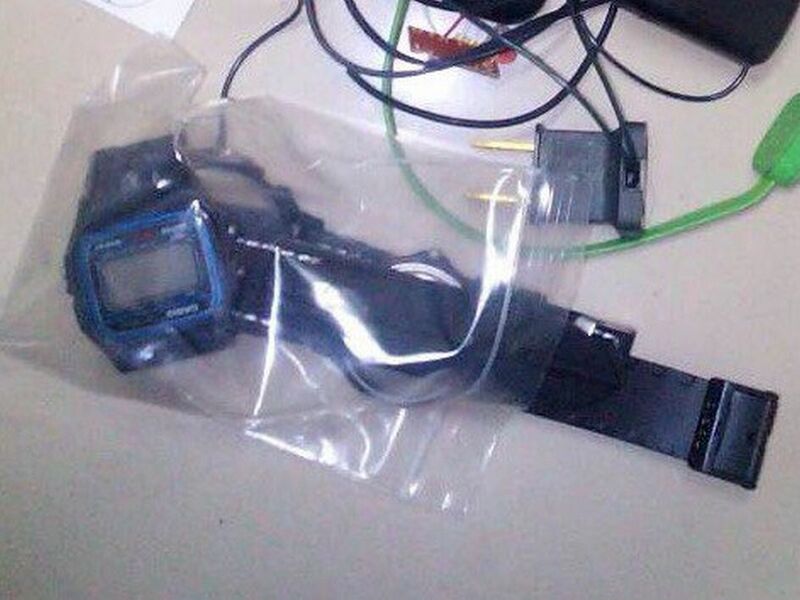 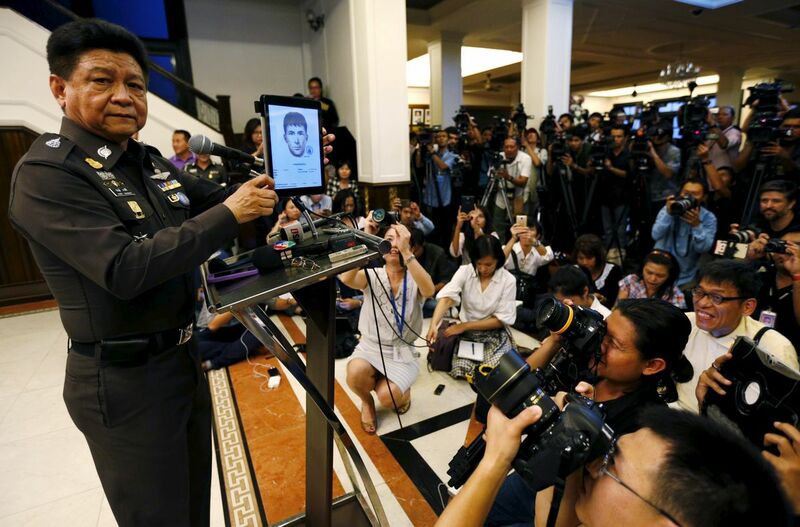 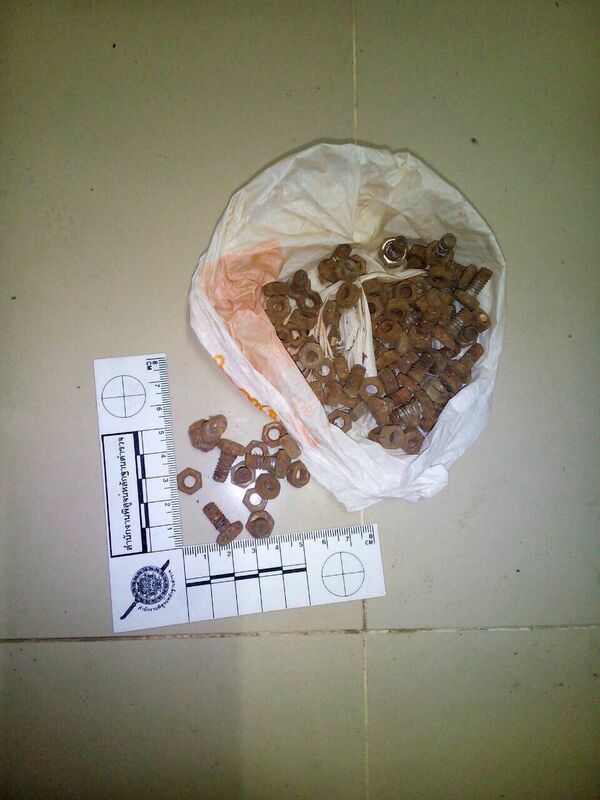 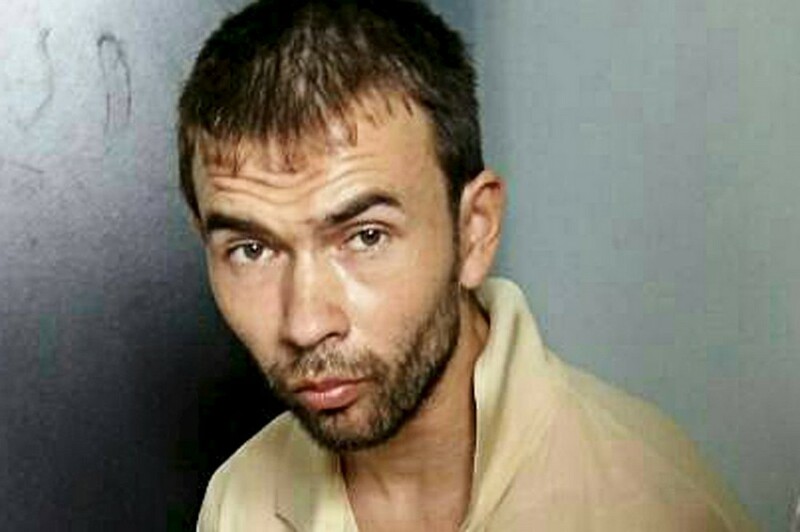 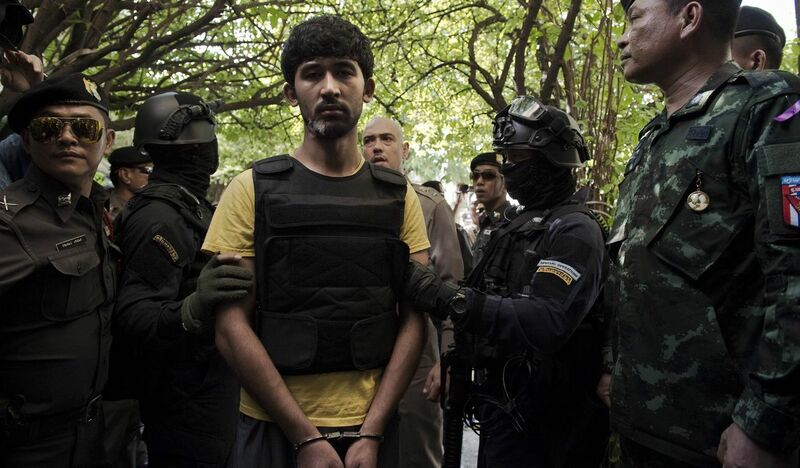 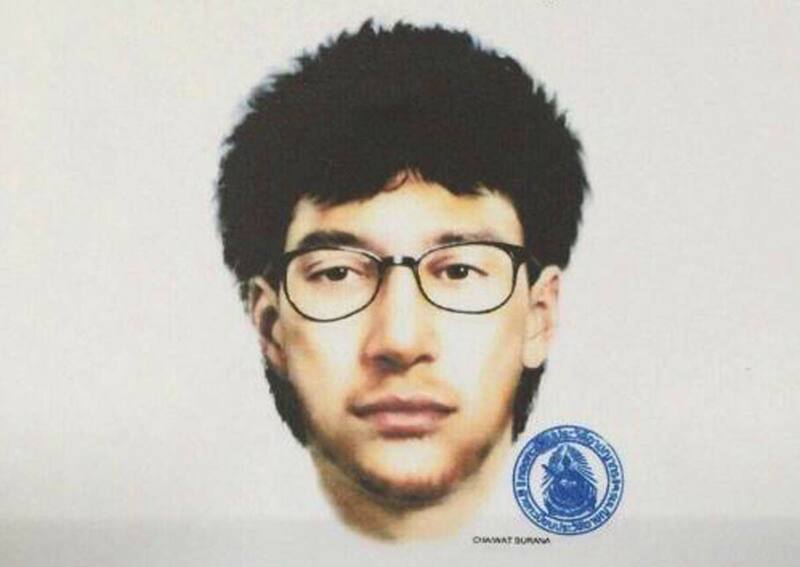 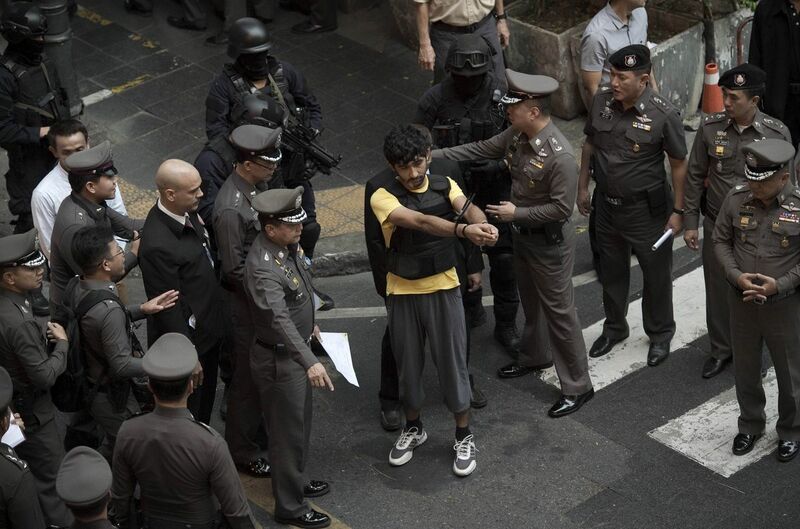 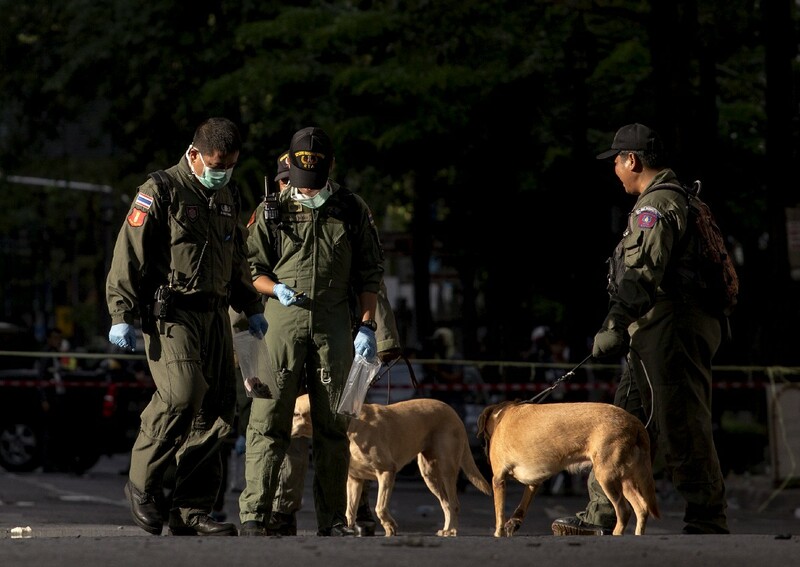 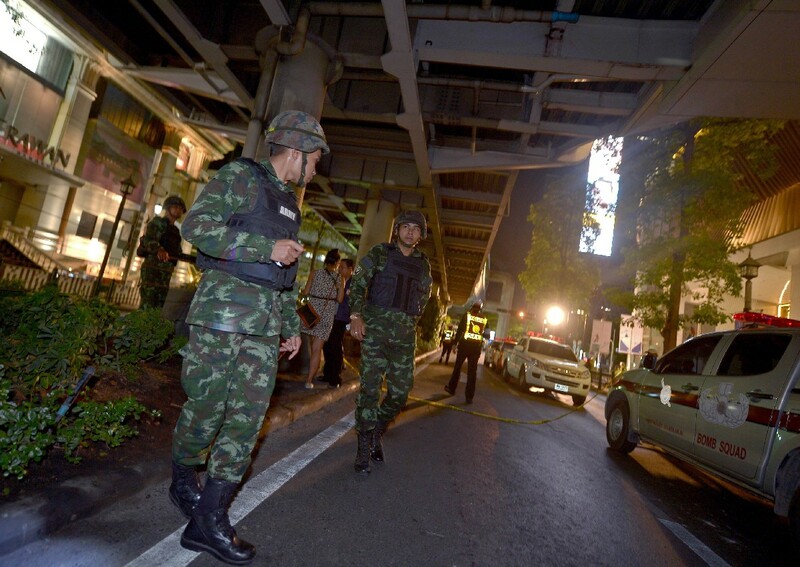 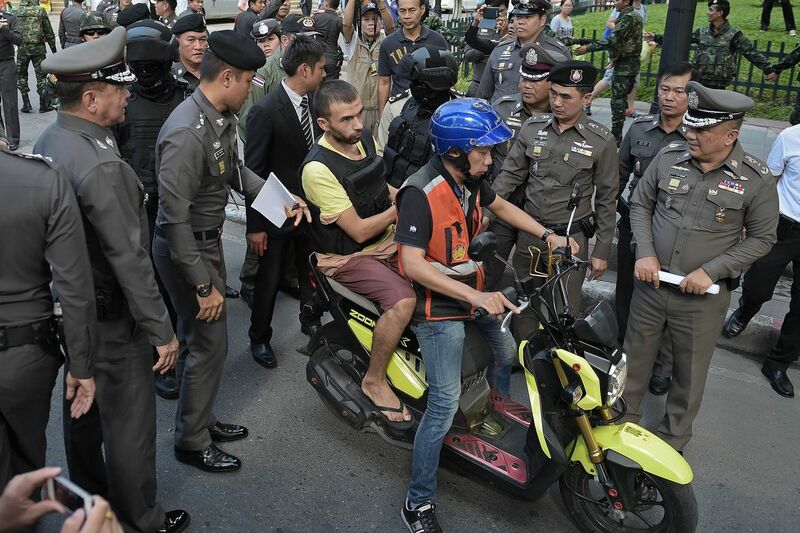 Thai police have so far not been able to hunt down the bomber, although a taxi driver, who may have driven the main suspect away from the area, was the latest to be questioned. 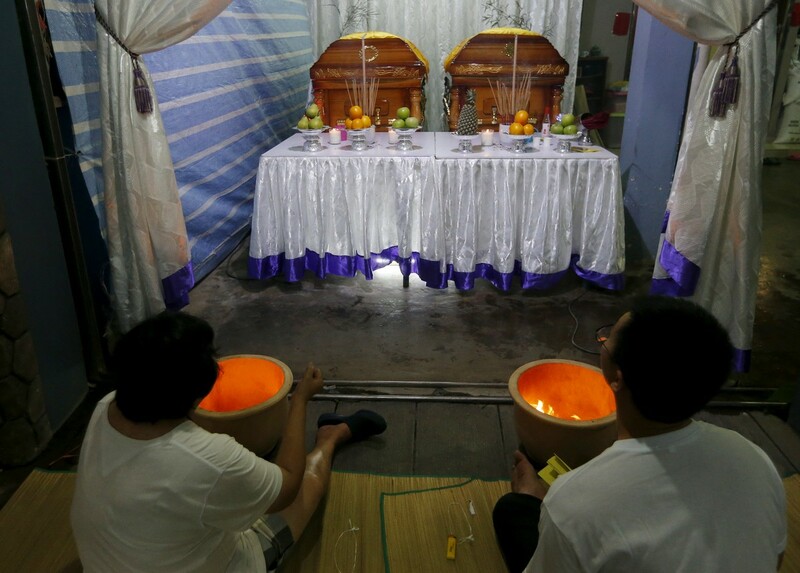 Yesterday, the final rites for Ms Liu began at around 10am, when family members, led by a Catholic priest, gathered to sing hymns. 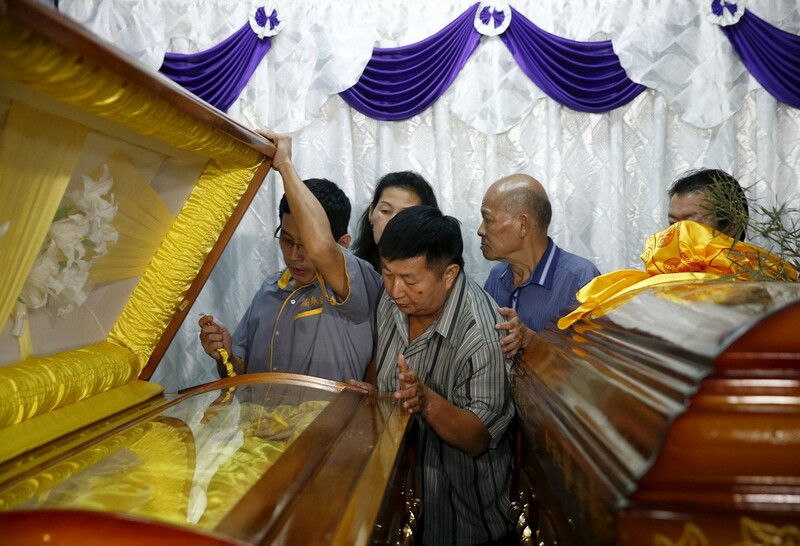 Limping towards the hearse carrying her coffin, Mr Ng, 35, gently placed his hand with his silver wedding band on it as her family members prepared to leave for a private church funeral at about 11am. 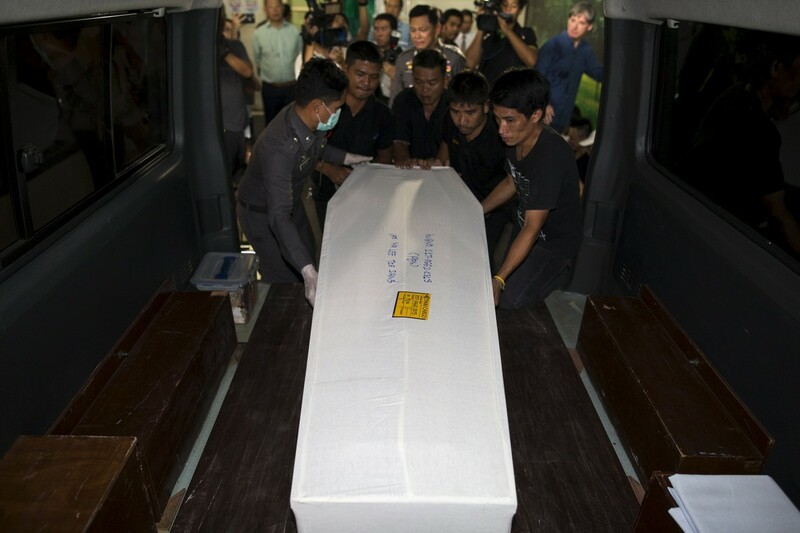 The final rites for Ms Liu began at around 10am, when family members, led by a Catholic priest, gathered to sing hymns. 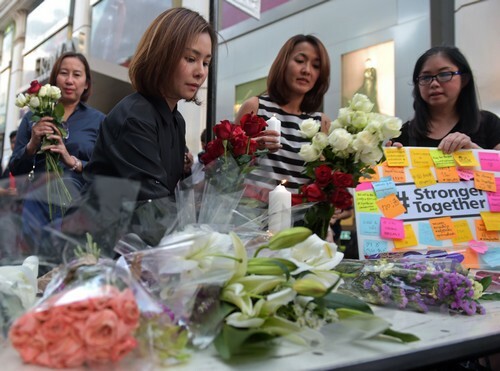 Ms Eleena Chew, 34, a close friend of Ms Liu's for more than 20 years, described her as "easy-going, always cheerful and rarely had a temper". 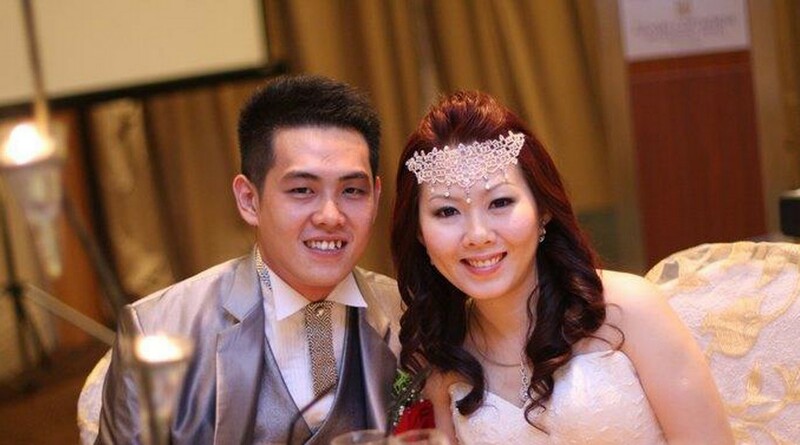 Mr Ng Su Teck with his wife, Ms Melisa Liu. 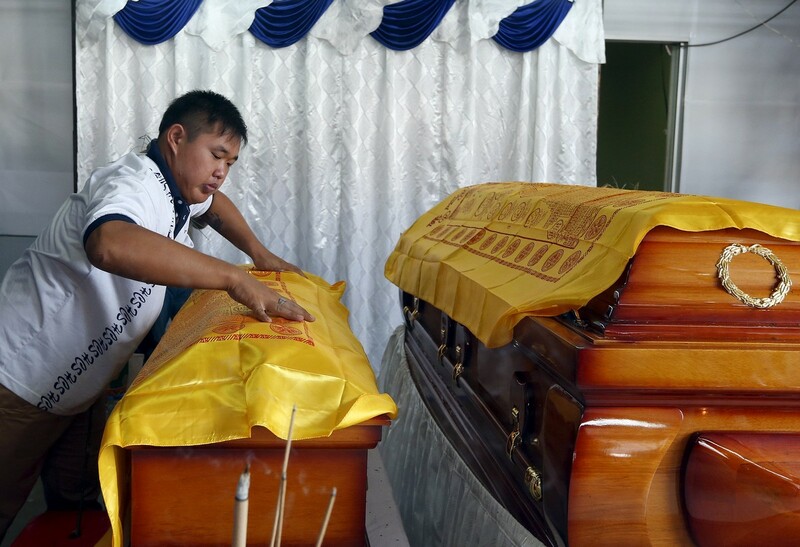 Lim Jian Han looking at the coffins of his father and sister at his home in Butterworth. 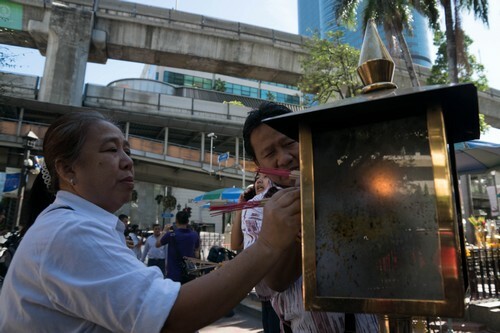 Bangkok Erawan Shrine bombing survivor Neoh Ee Ling, who is five months' pregnant, could not bring herself to be present for the arrival of the bodies of her husband and daughter. 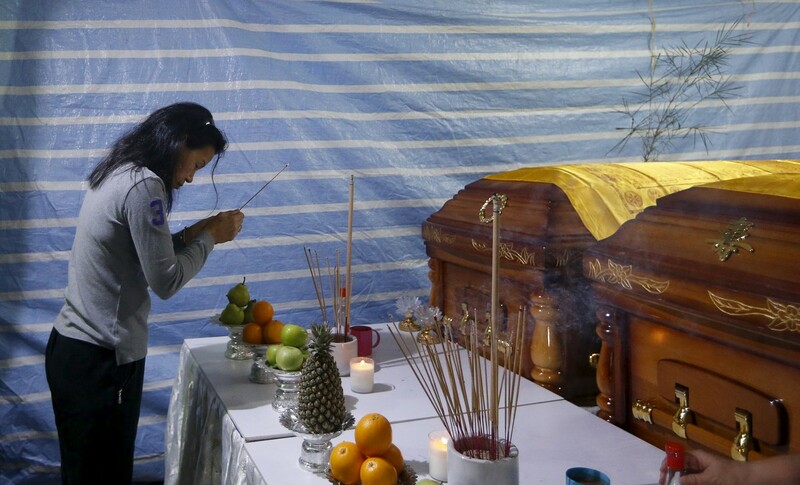 She was still distraught following the deaths of her husband, daughter, mother and brother. 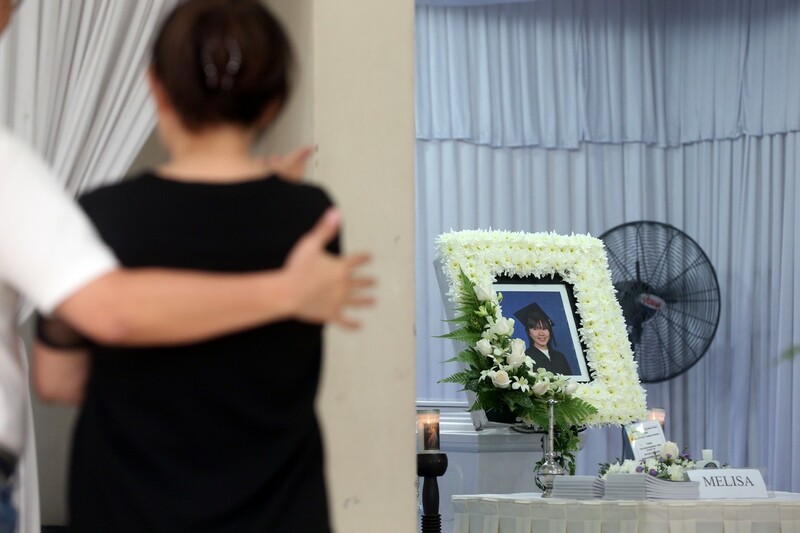 Her son, Lee Jian Han, was still confused and puzzled about was going on around him, and family members say they have tried to distract him when he asked for his father and sister. 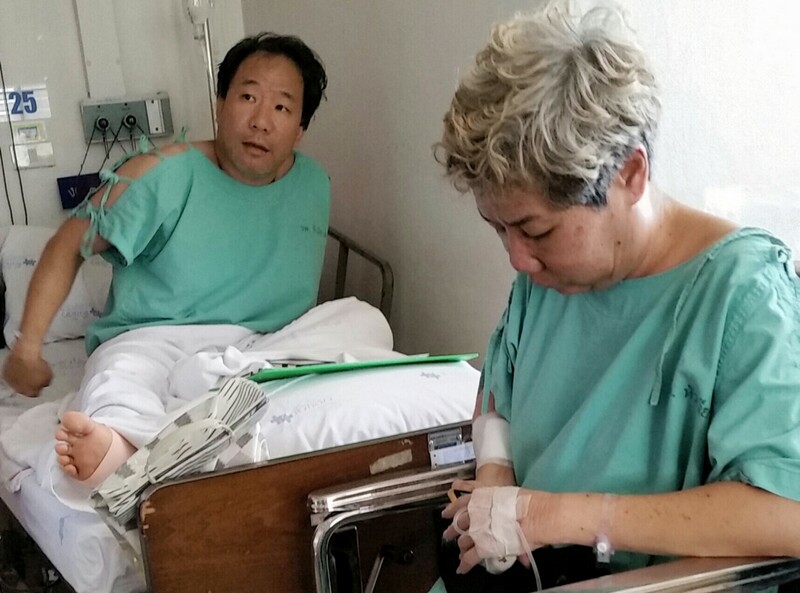 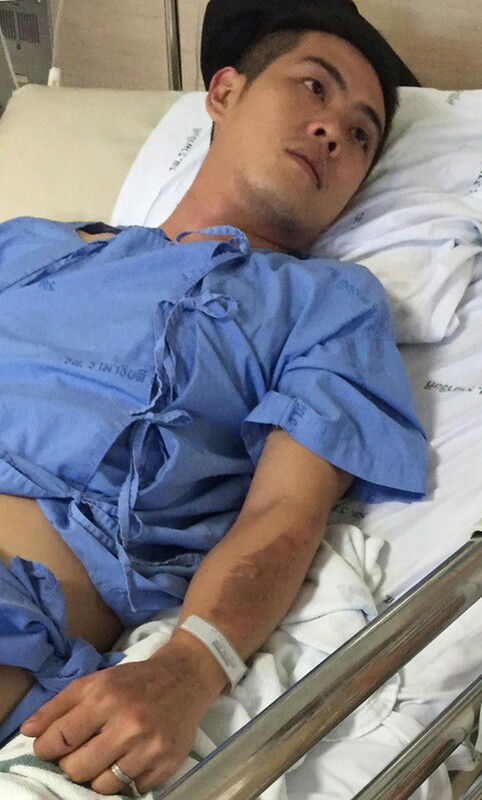 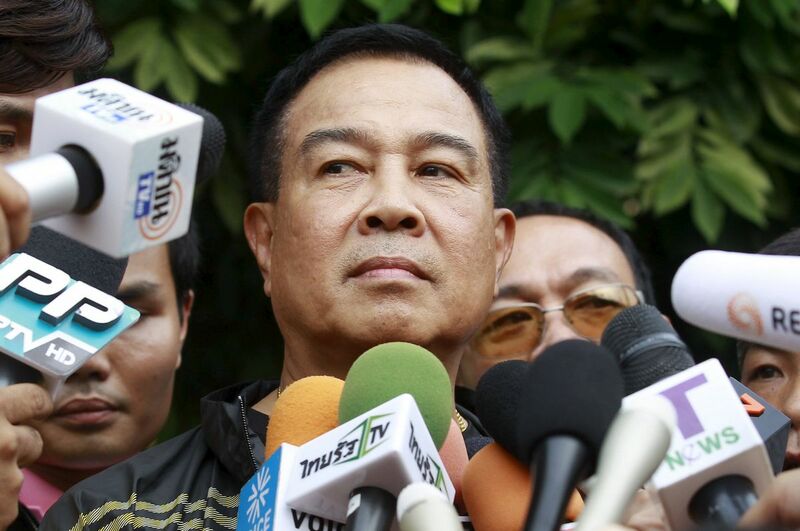 Mr Ng Su Teck, whose wife Melisa Liu Rui Chun was killed in the blast, in hospital in Bangkok. 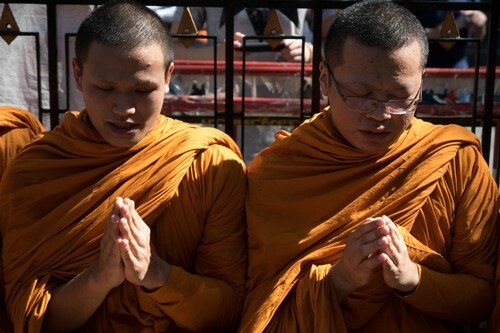 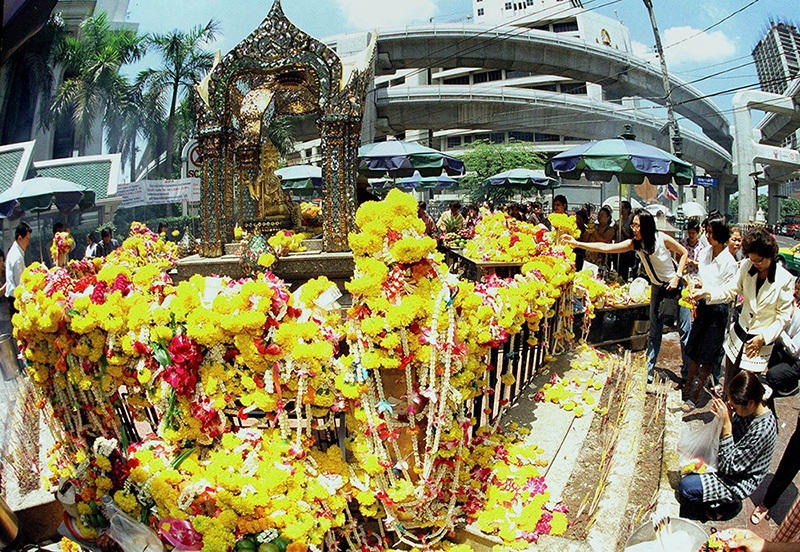 It is a yearly affair for the Ong siblings to visit Bangkok and offer their prayers at the downtown Erawan shrine. 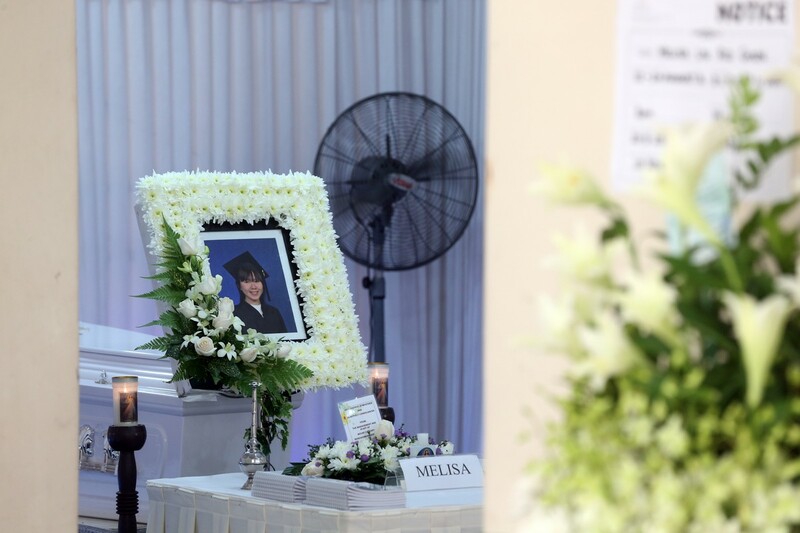 Ms Betty Ong, 69, a semi-retired administrative executive, was there with her sister Jane, 59, brother Wesley, 53, and his wife Jennifer, 41. 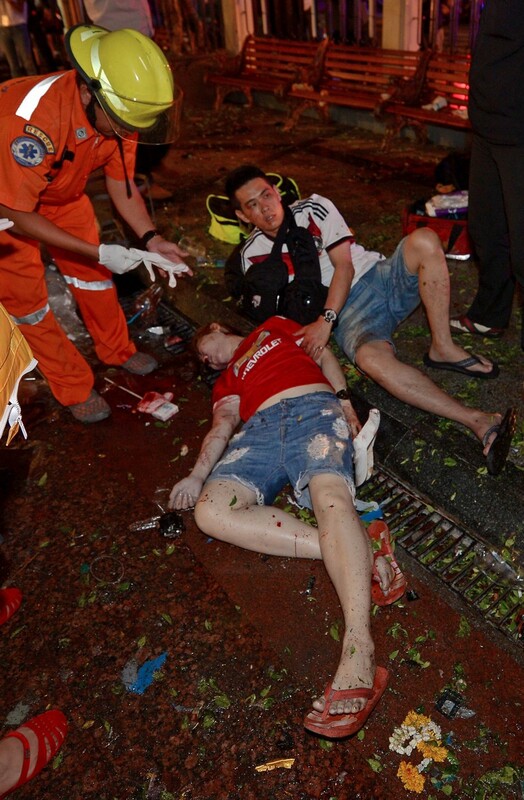 Ms Ong said there were two blasts, the second very loud. 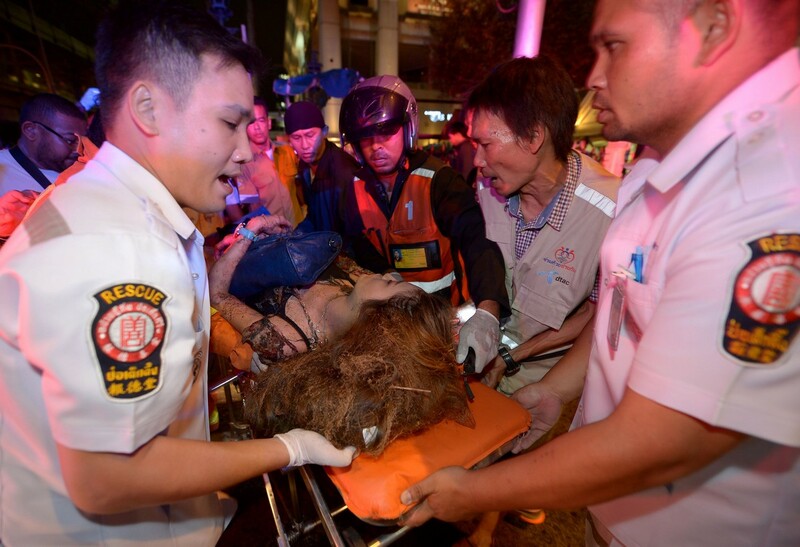 All four suffered partial hearing loss. 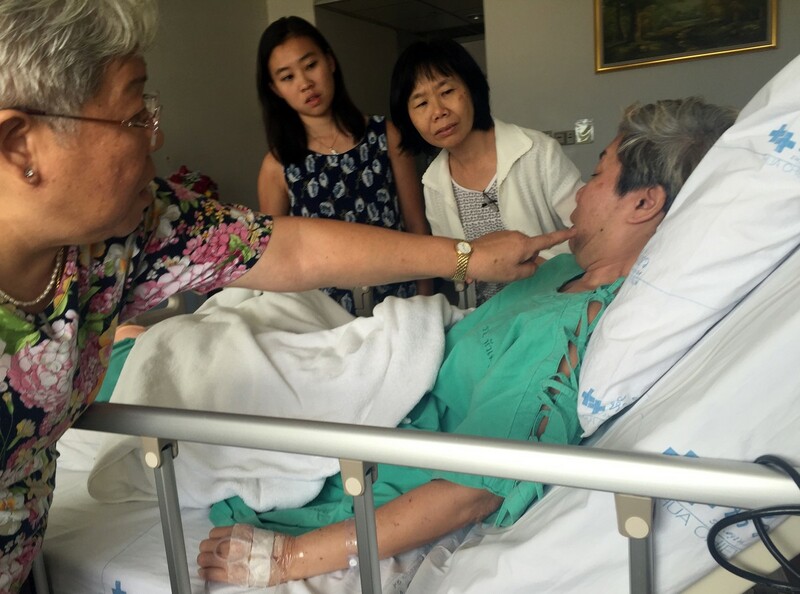 "We are very lucky to be alive," said Ms Ong, who needed six stitches on her left thigh and has since been discharged. 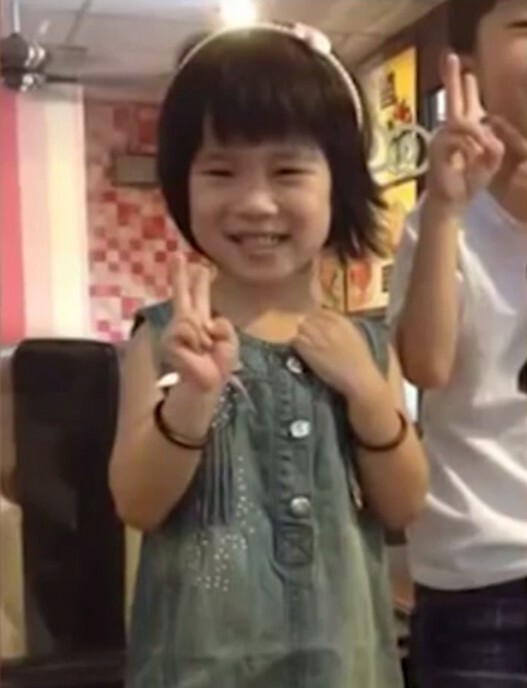 Her siblings' injuries were more serious. 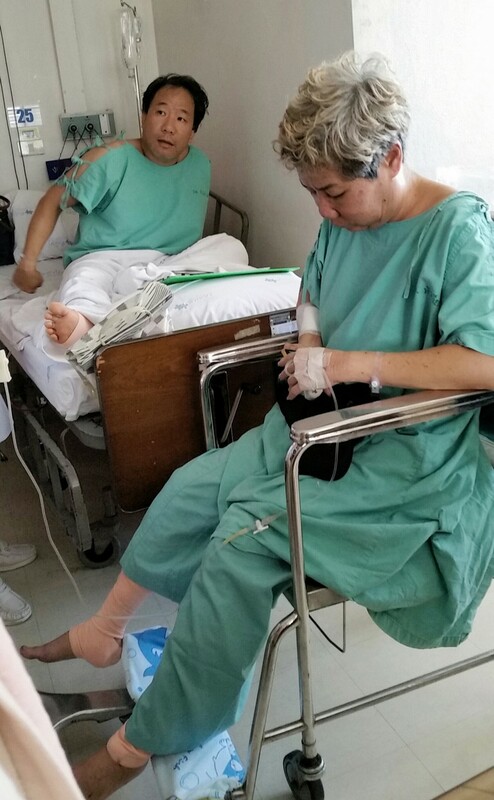 Her sister Jane needed two operations, one to remove shrapnel in her leg and another last night to remove the fragments in her forehead. 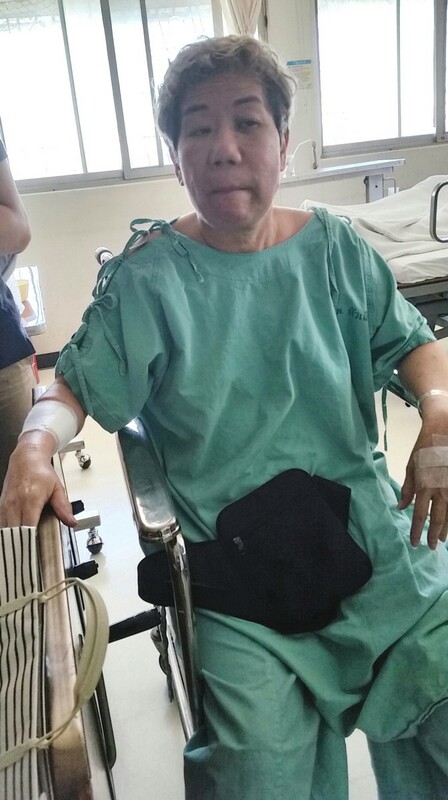 The younger Ms Ong became emotional when she recalled the traumatic event: "There was this blinding light and the next moment when I opened my eyes, my spectacles had been blown off by the impact. 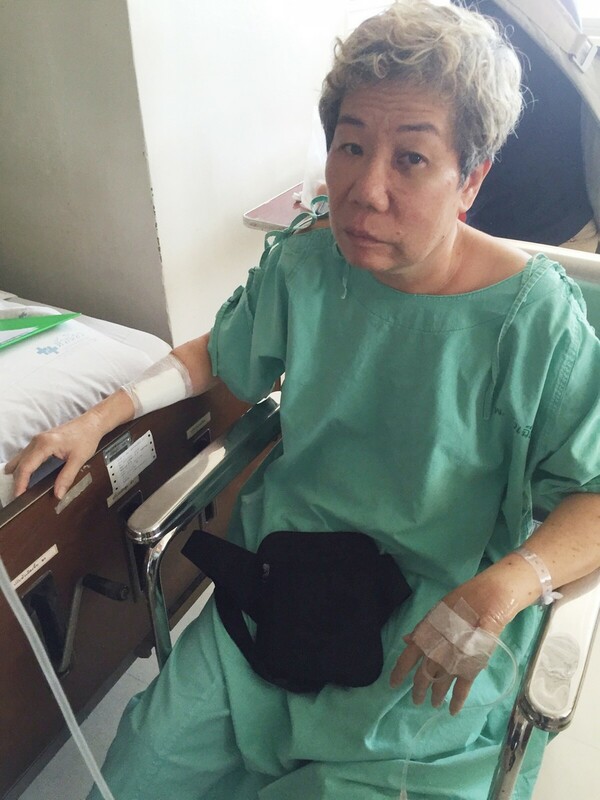 I felt as if my skin was burning off." 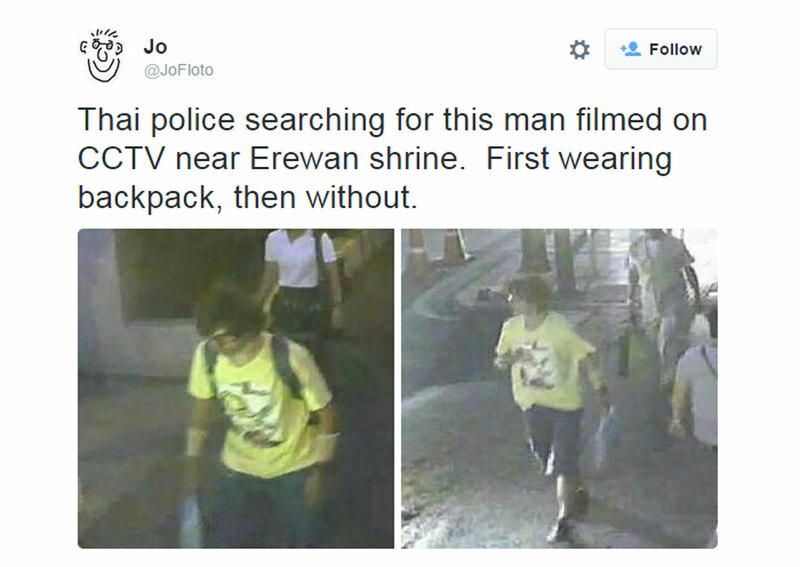 "I try to be positive but the images keep coming back to me. 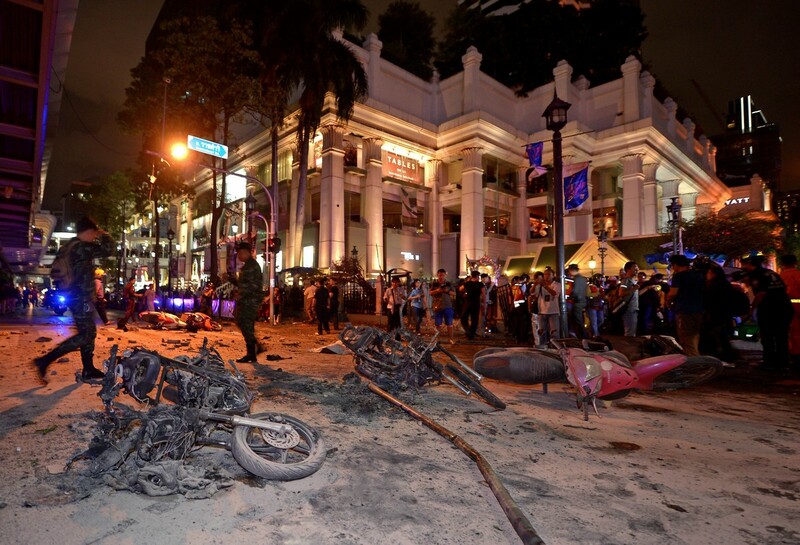 There were so many dead bodies. 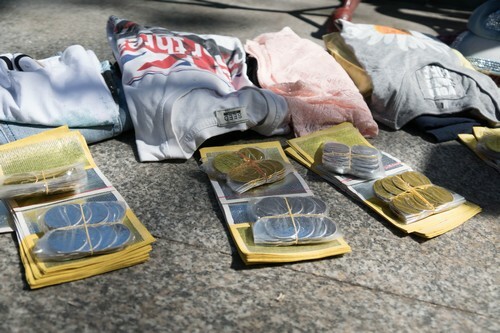 It's a very cruel thing. 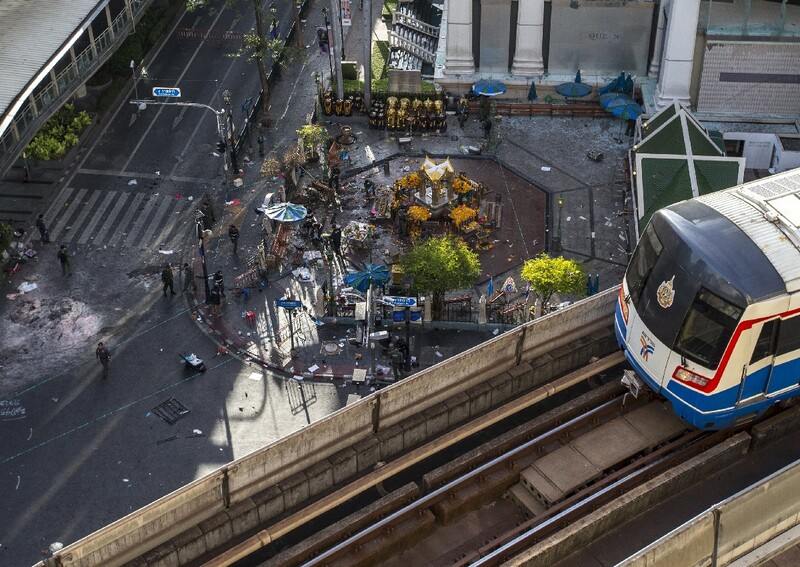 Very inhuman thing to do." 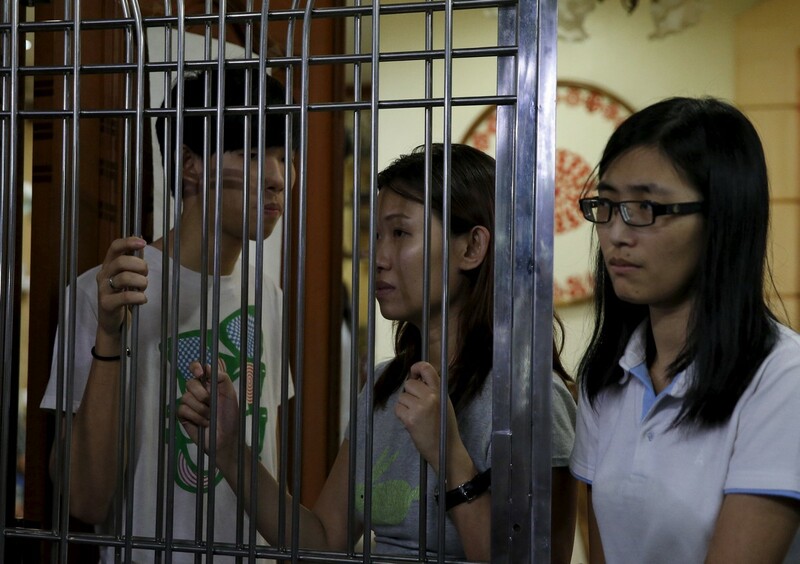 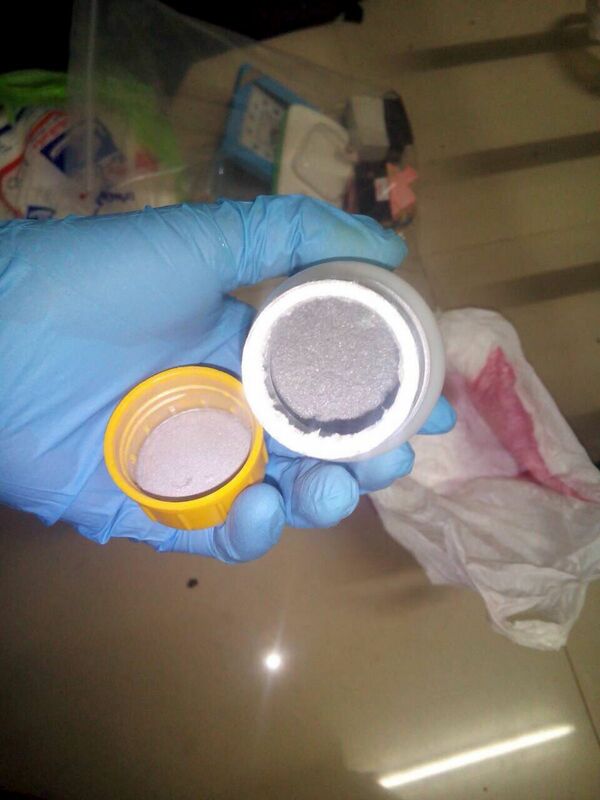 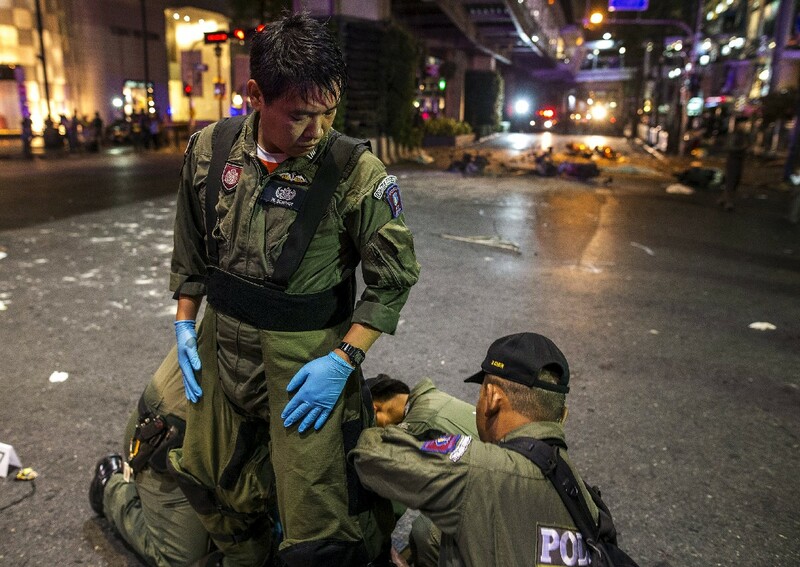 The Singapore Embassy has engaged an interpreter to assist the Ongs at the hospital. 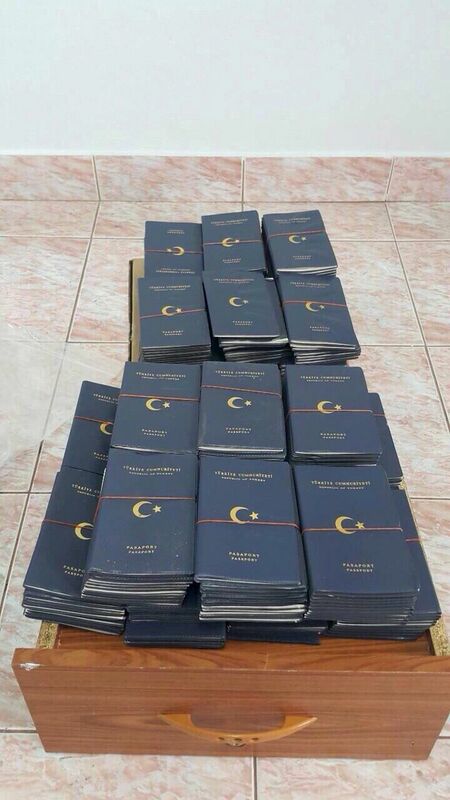 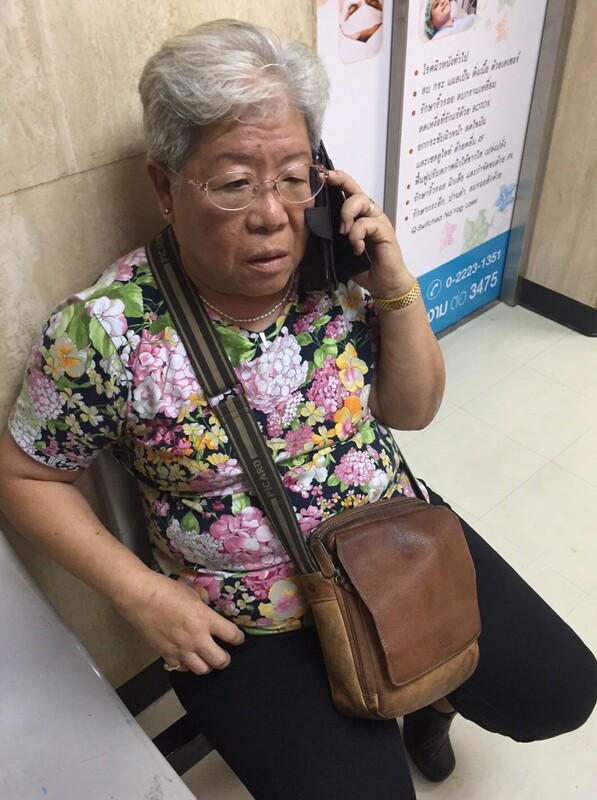 Madam Ong said that the Thais had been very helpful, and the family even received a visit from Thai PM Prayuth Chan-ocha, who gave them 5,000 baht (S$297) each to tide them over. 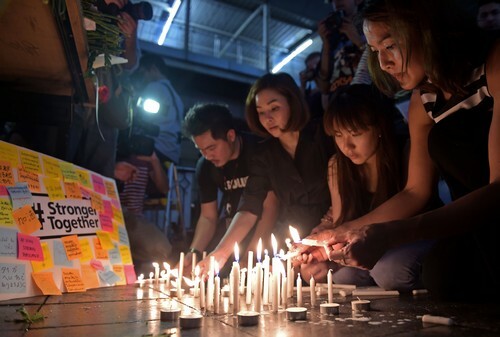 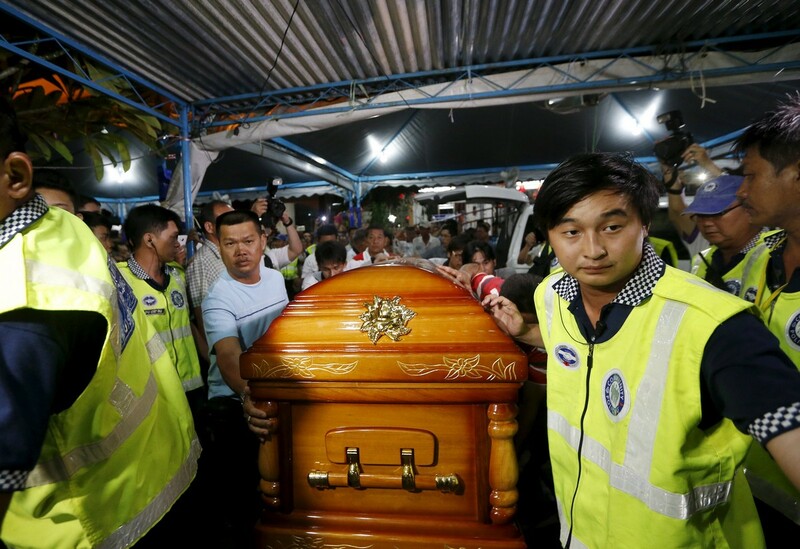 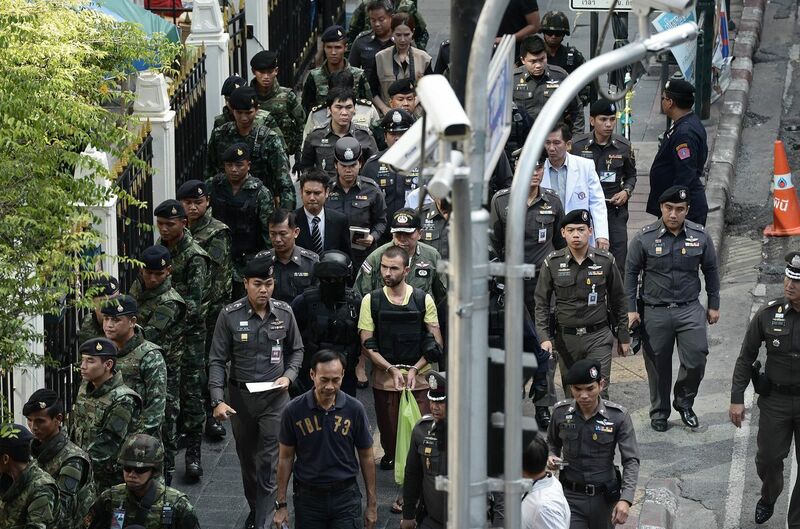 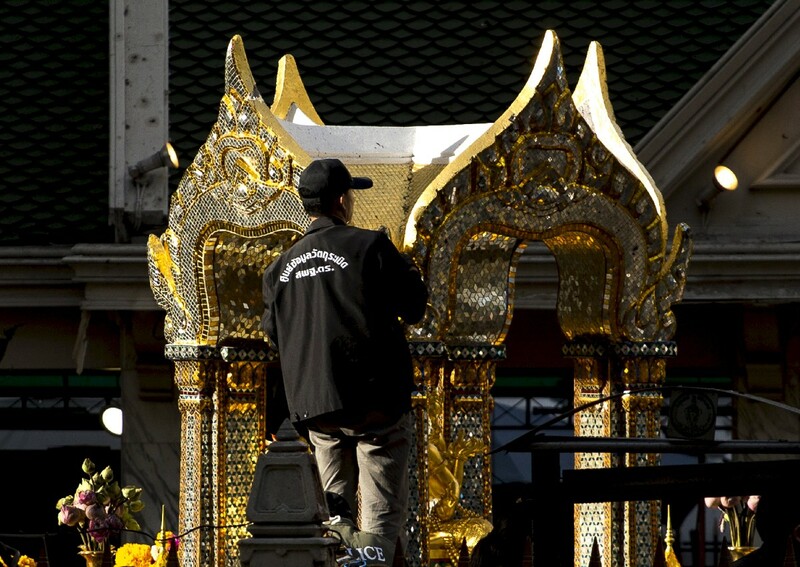 It was a solemn ceremony as the bodies of two victims killed in the Bangkok bomb blast returned home. 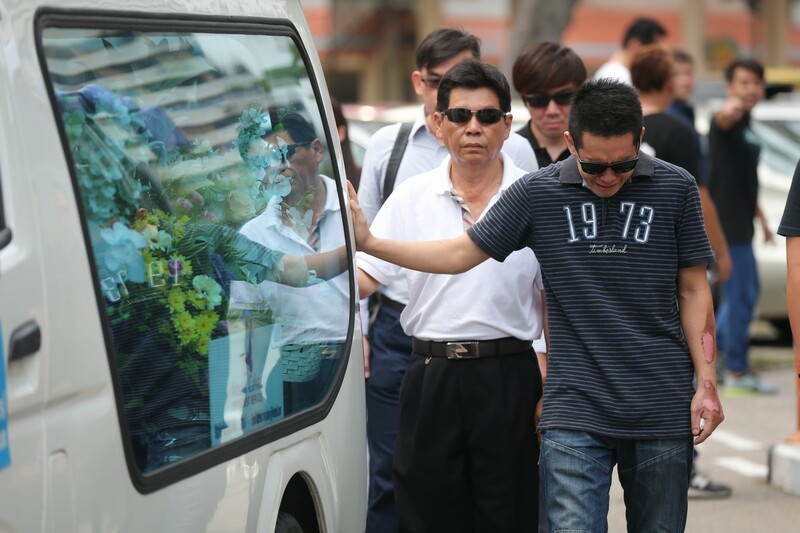 The bodies of Lee Tze Siang, 35, and his four-year-old daughter, Lee Jing Xuan, arrived at their home in Butterworth, Penang. 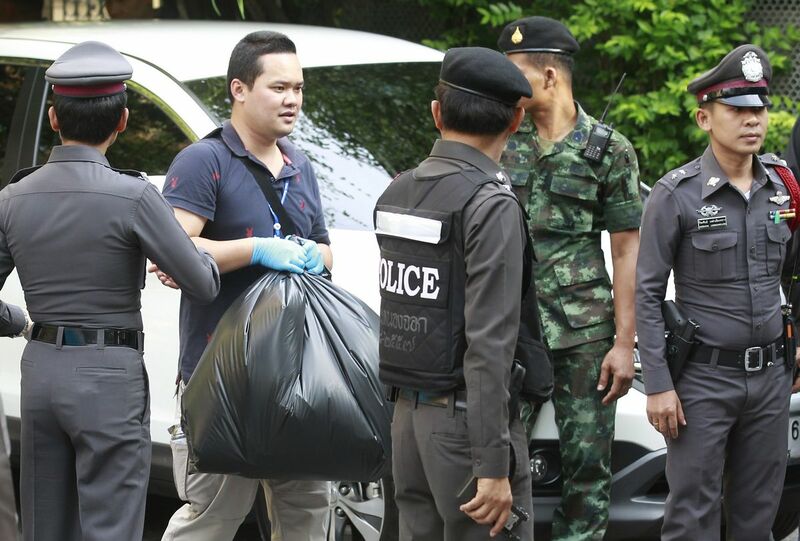 The two bodies arrived in separate white vans at about 1.50pm. 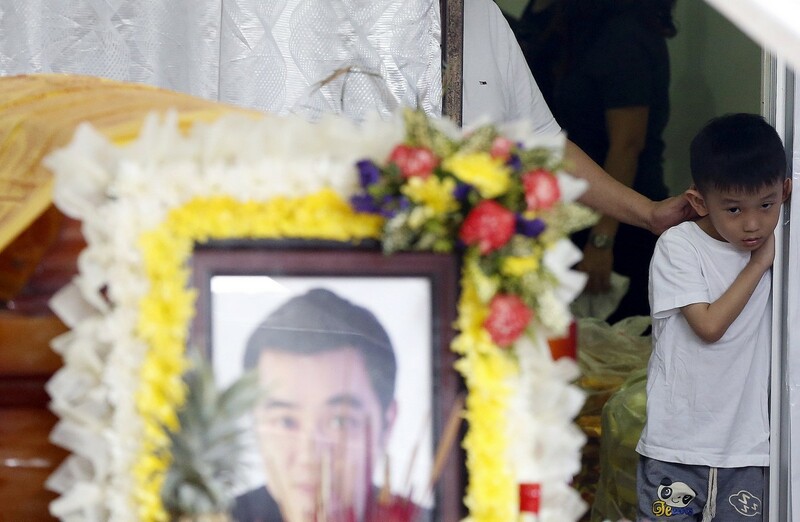 Present at the house when the caskets arrived was Tze Siang's six-year-old son, Lee Jian Han. 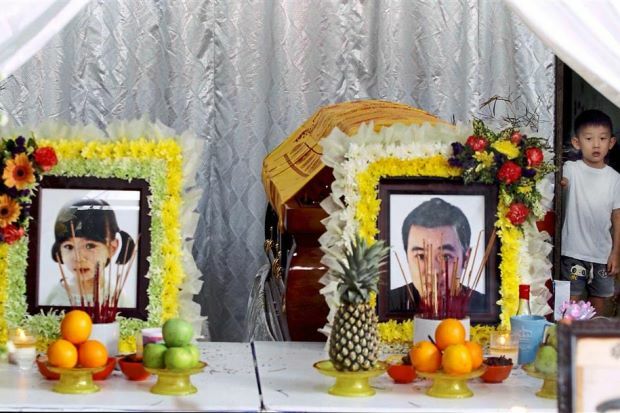 Close friends and family members, including Tze Siang's father Lee Tiang Heng, 61, were also there. 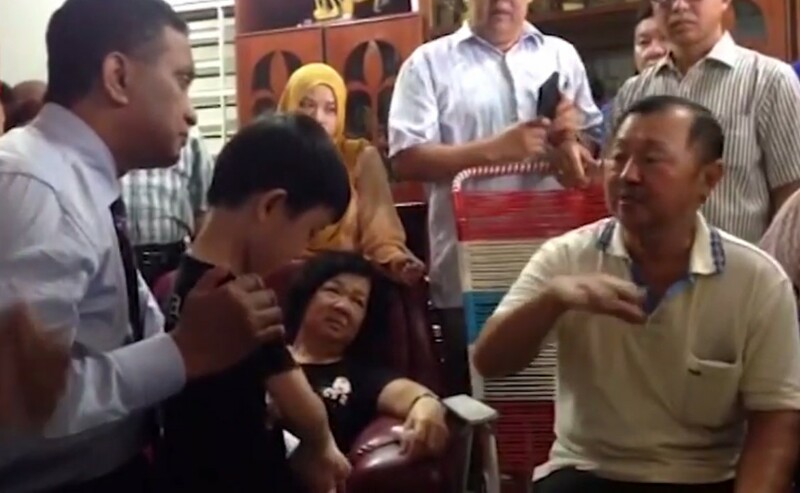 When six-year-old Lee Jian Han saw a photograph of his father on the evening news, he had repeatedly asked his grandpa­rents why he was on TV. 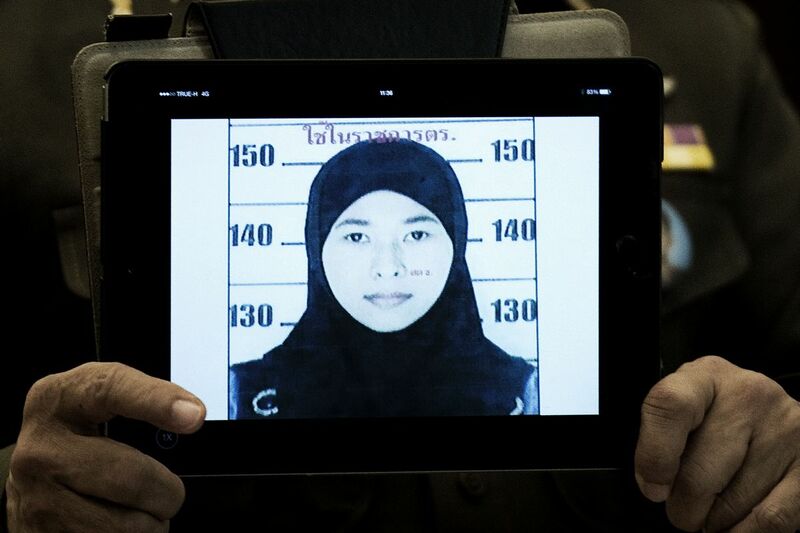 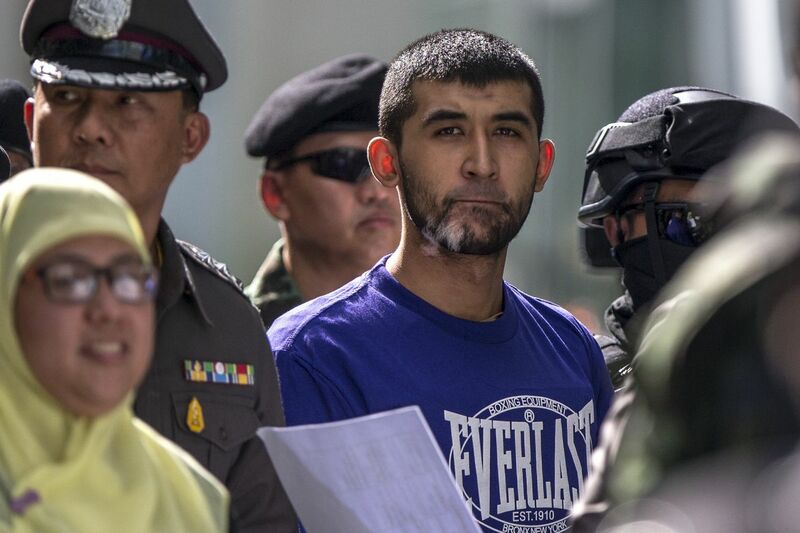 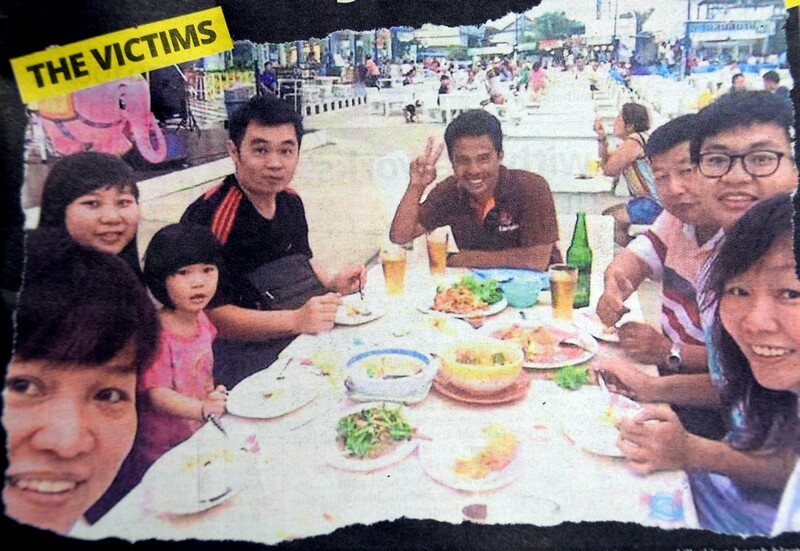 The family from Taman Dedap, Butterworth, had been on holiday in Bangkok when the bombing occurred. 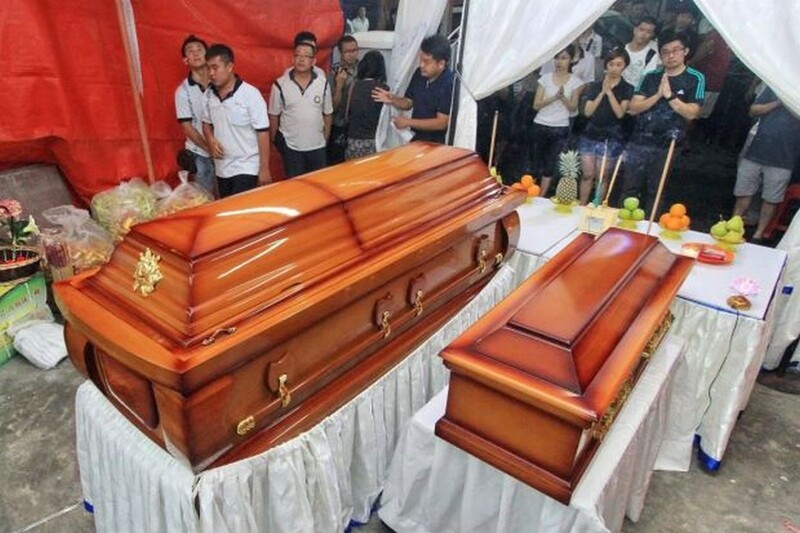 5 members of the family died. 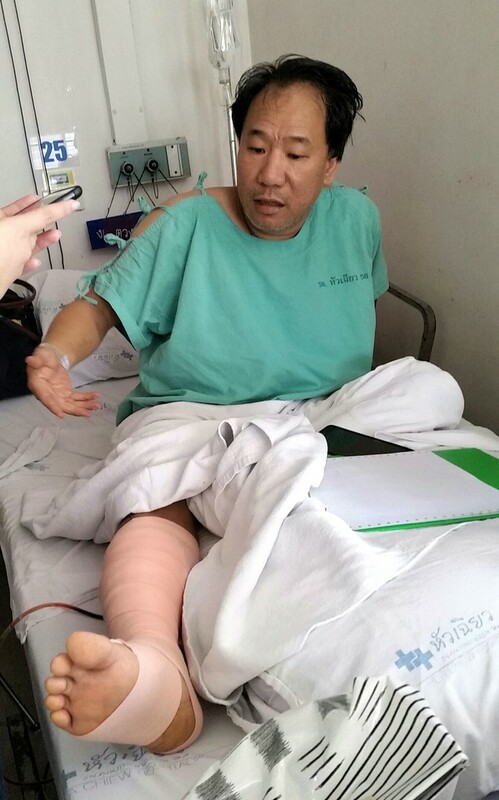 It was a sombre homecoming for Neoh Ee Ling, who had arrived here on a holiday in a joyful mood but returned home under tragic circumstances. 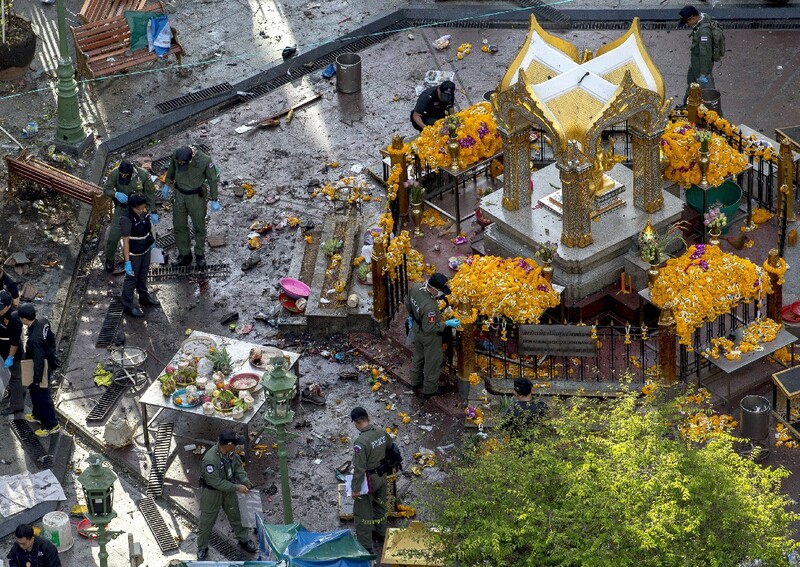 The 33-year-old flew home with the remains of four family members killed in Monday’s deadly bombing at the Erawan shrine. 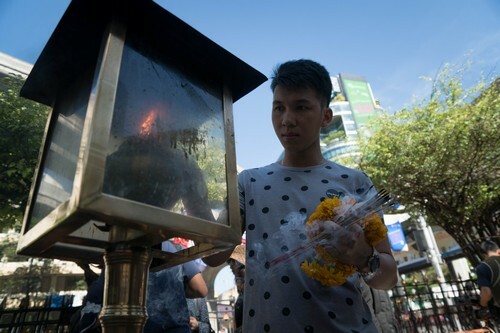 A family member of Neoh Hock Guan, a survivor of Monday's blast in Bangkok, pays her last respects to his wife and son who were killed in the attack. 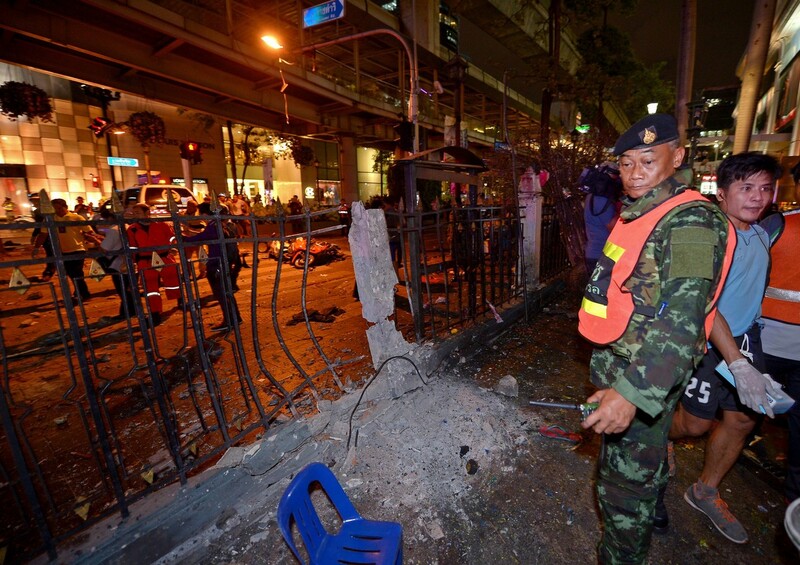 Neo Ee Ling and her father, Neoh Hock Guan, 55, sustained minor injuries in the blast. 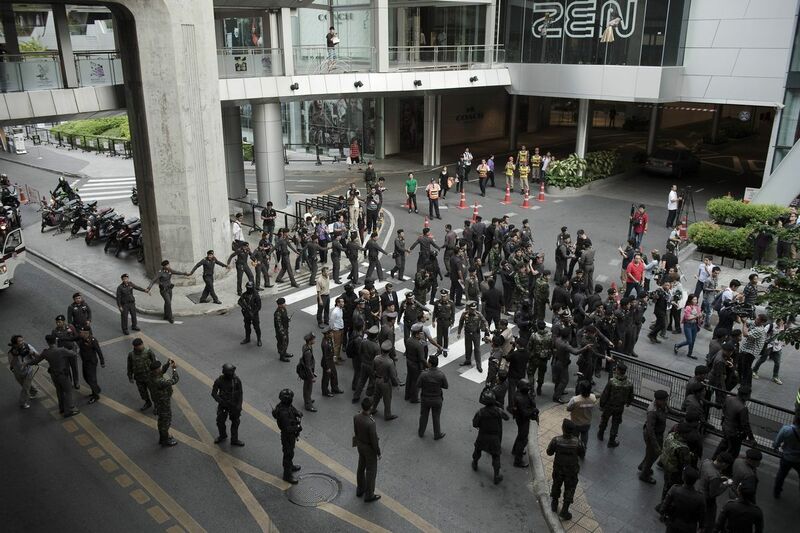 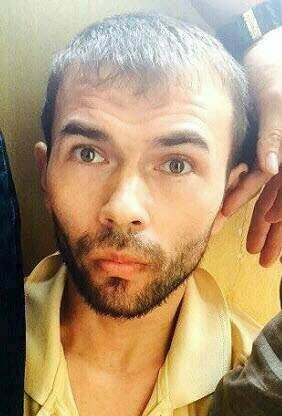 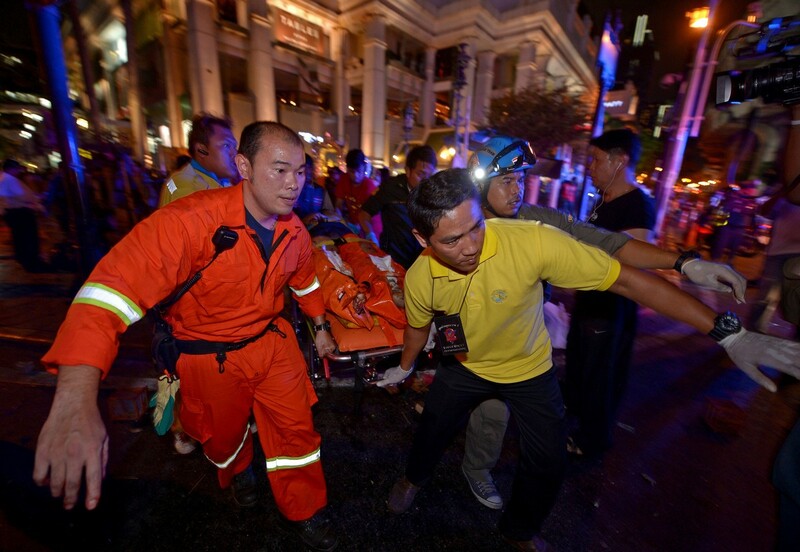 Four Malaysians have been confirmed as casualties of the incident, while a fifth, Lim Su See, is believed killed. 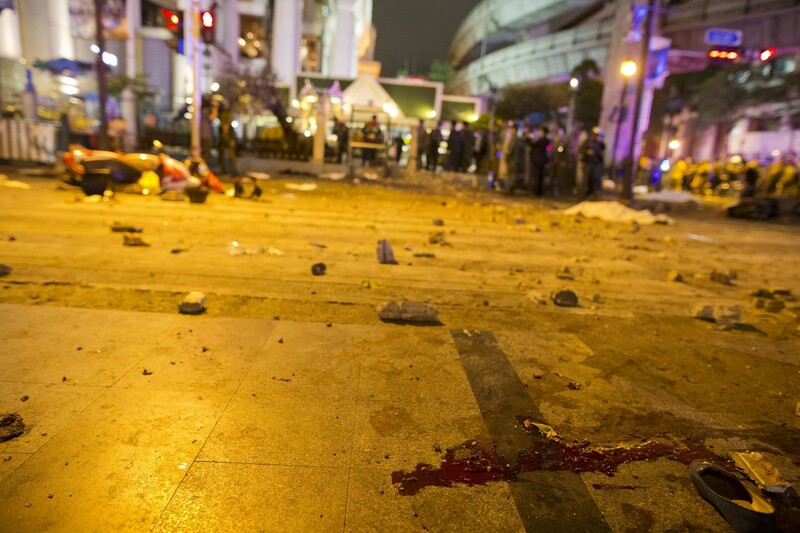 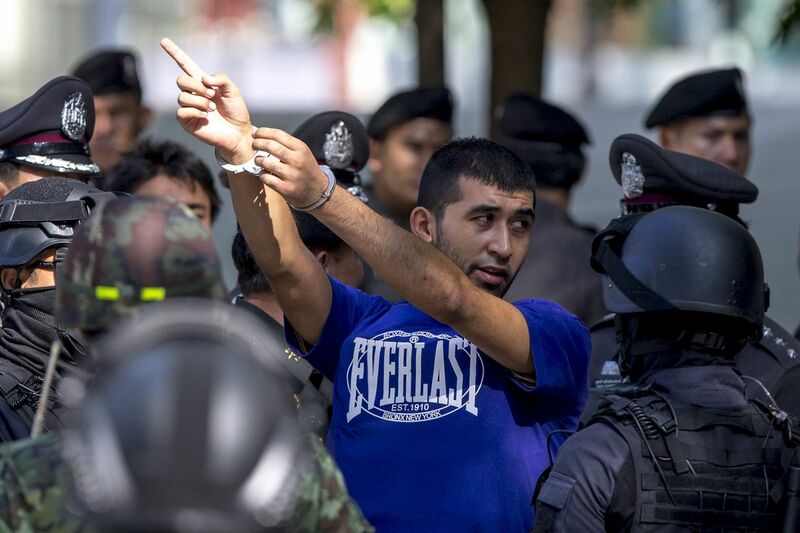 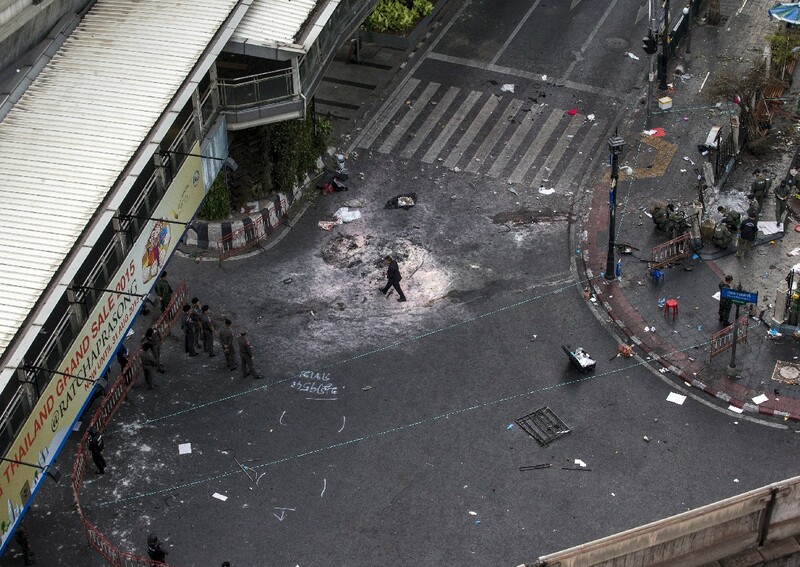 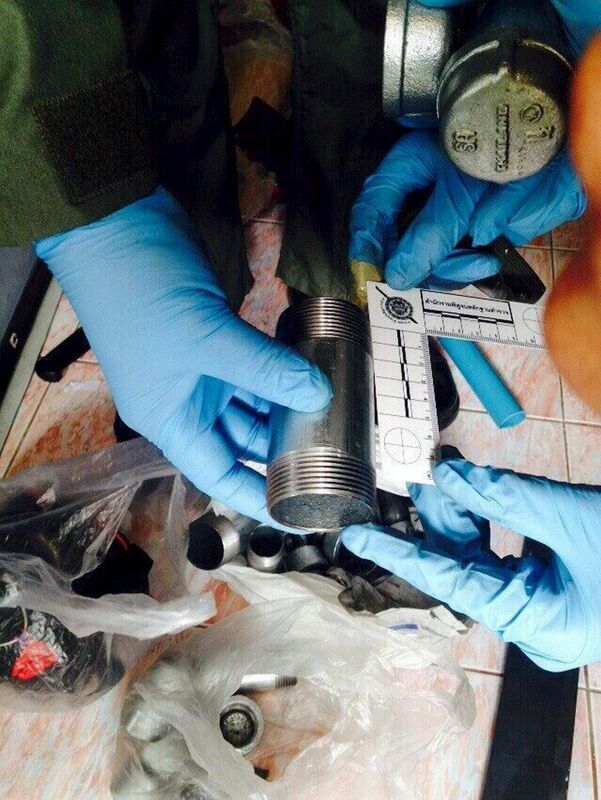 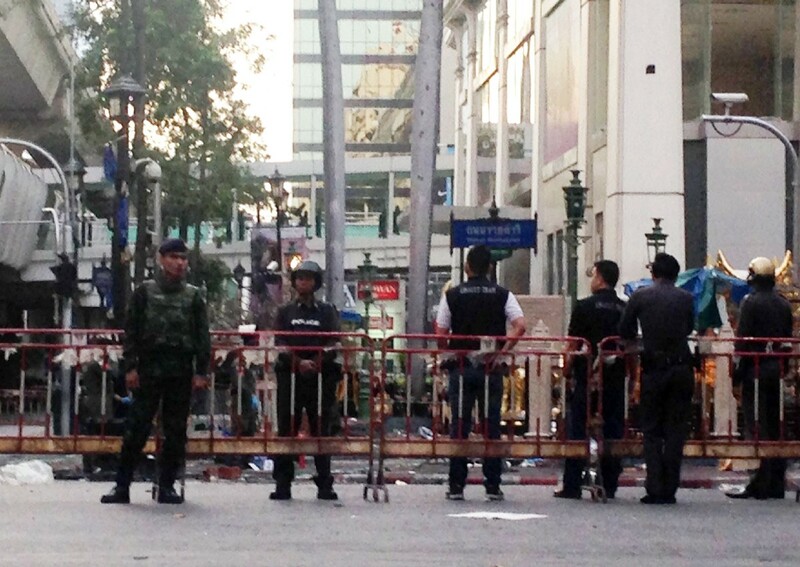 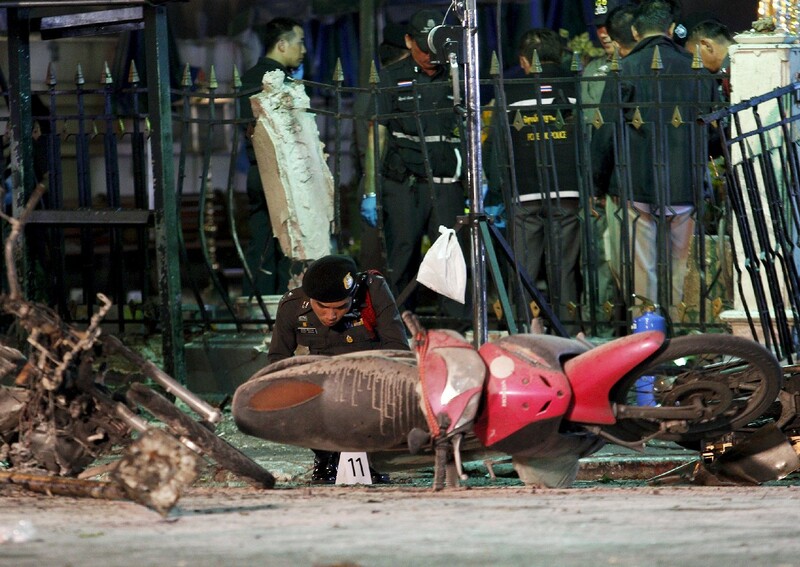 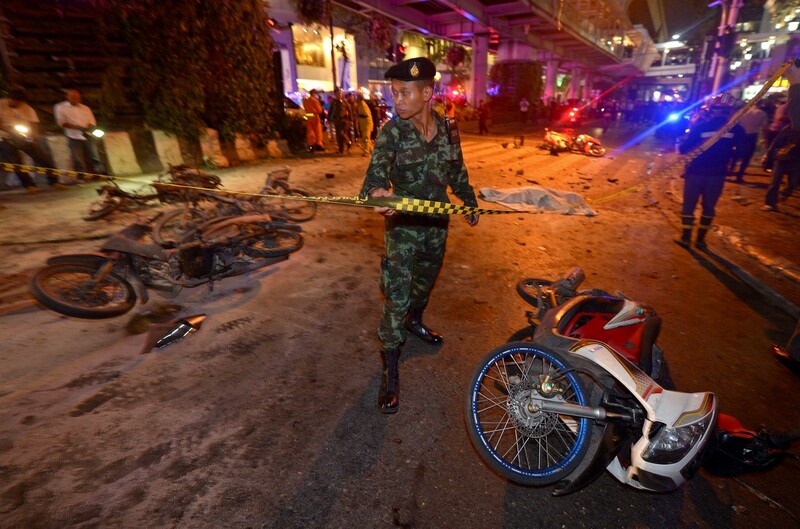 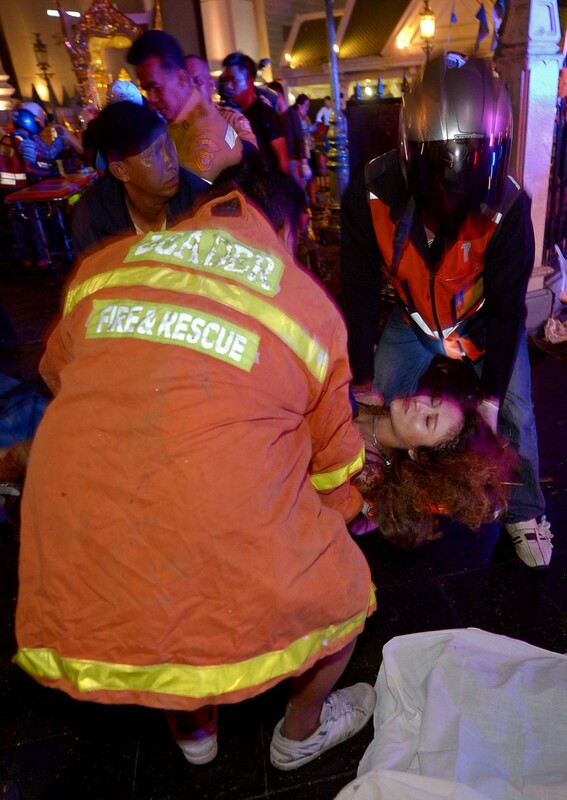 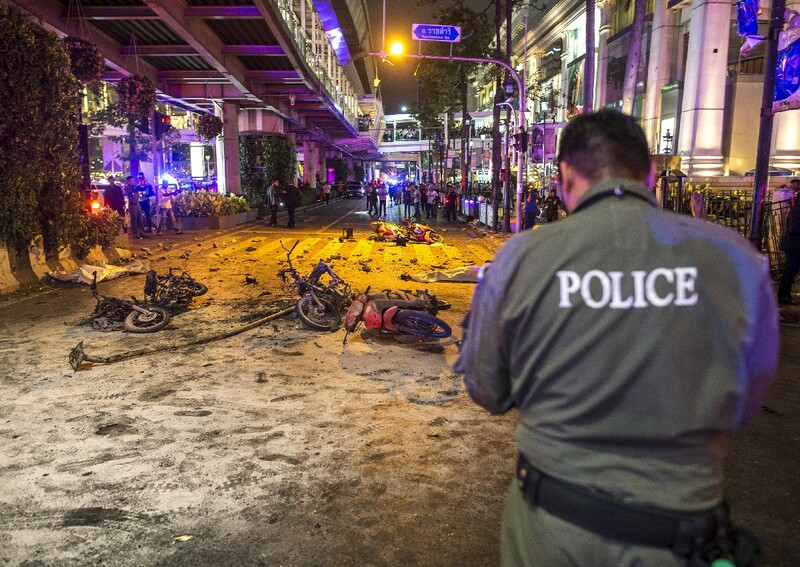 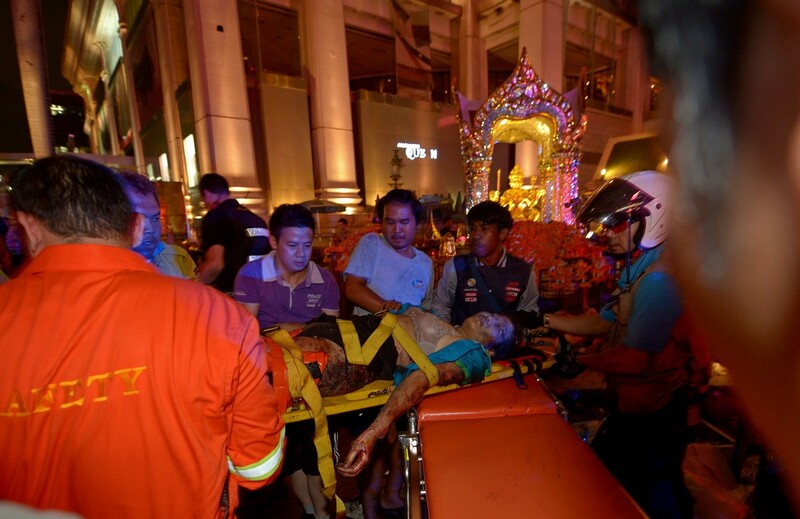 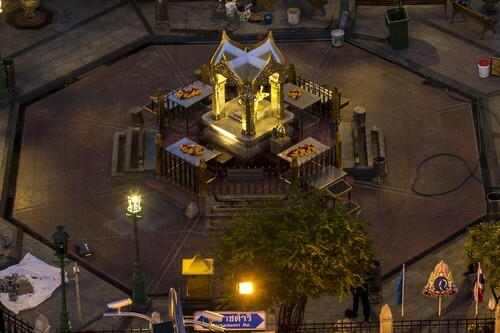 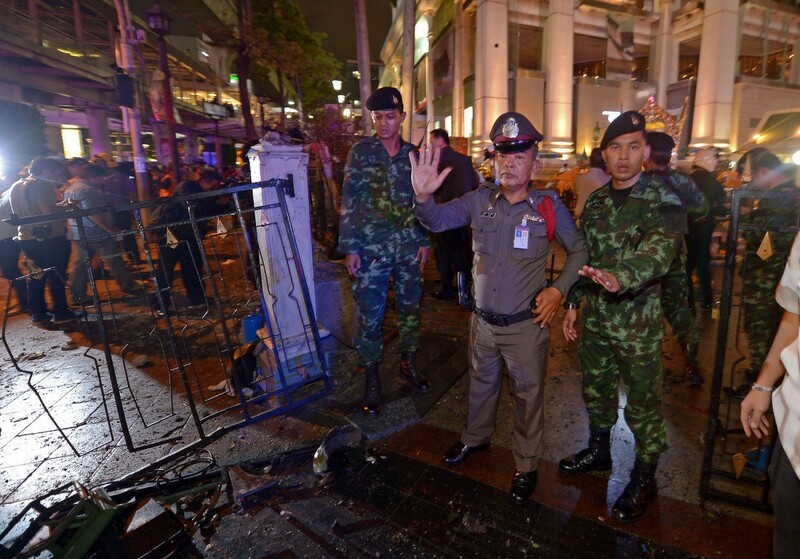 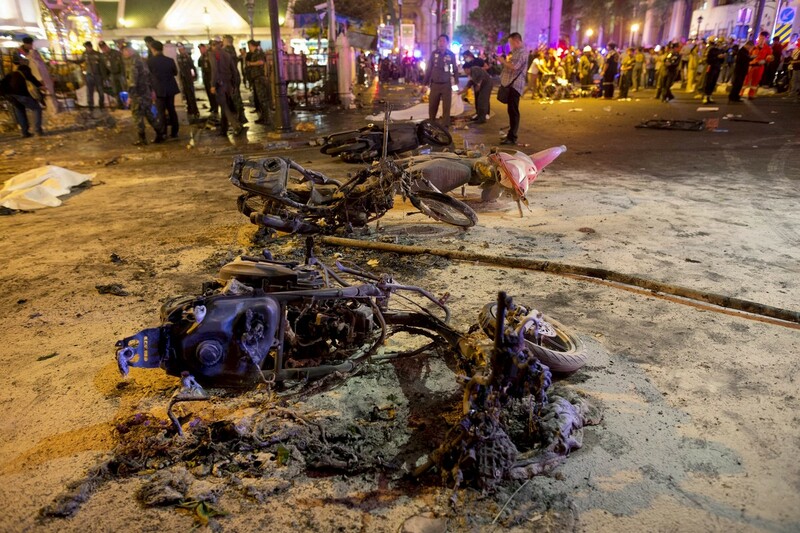 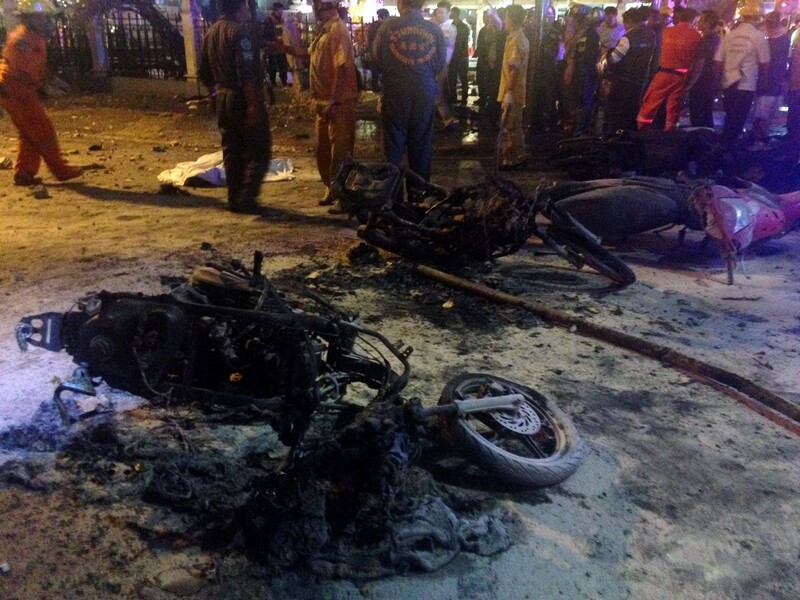 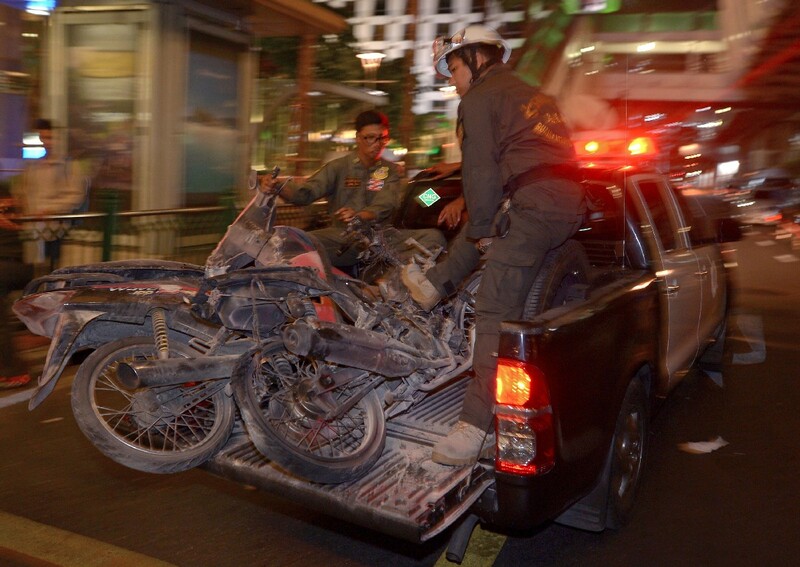 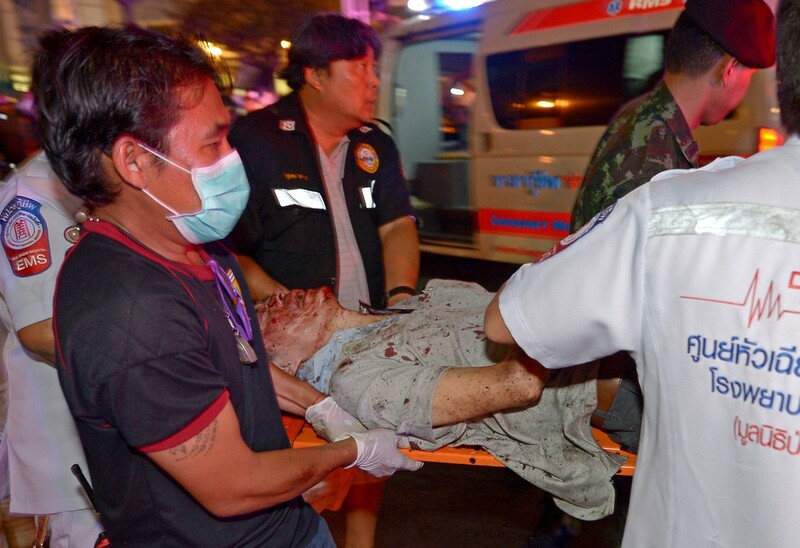 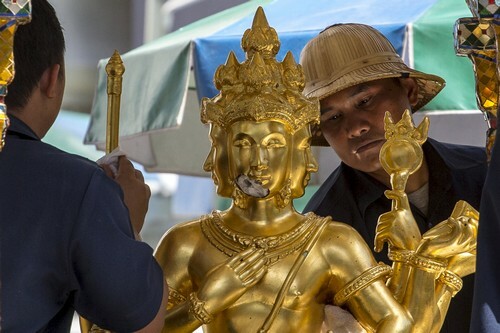 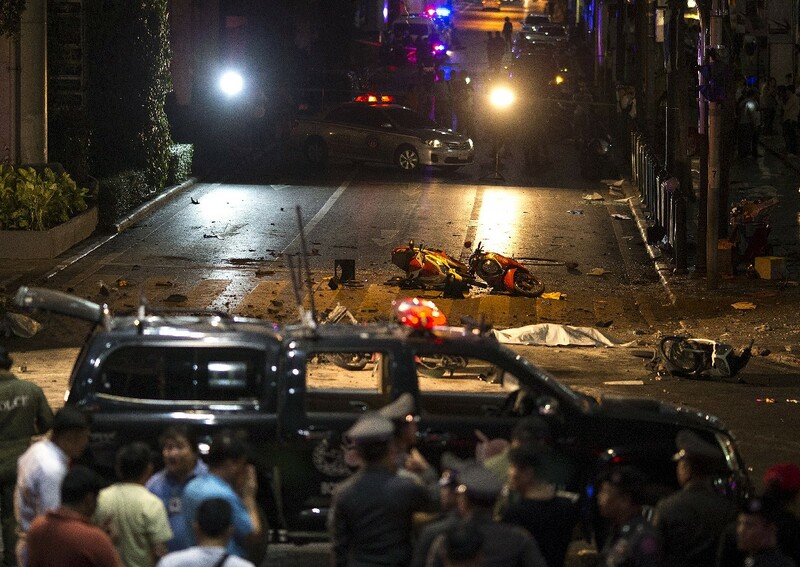 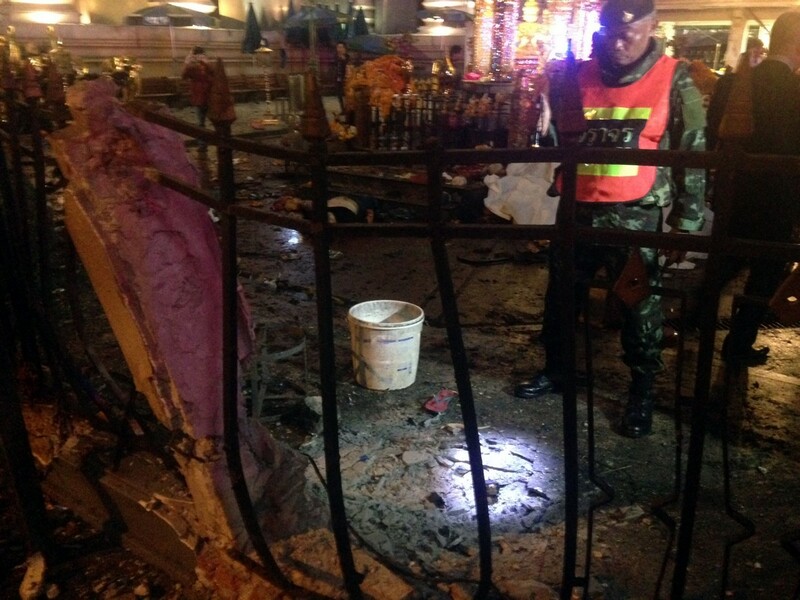 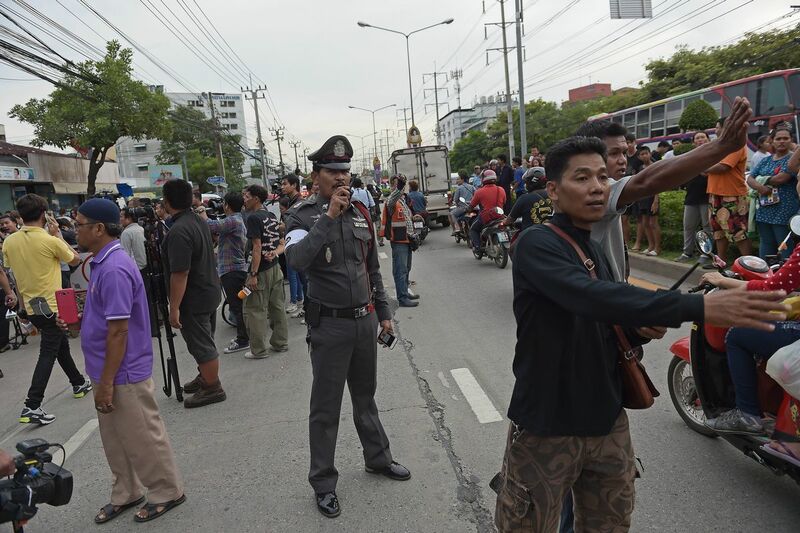 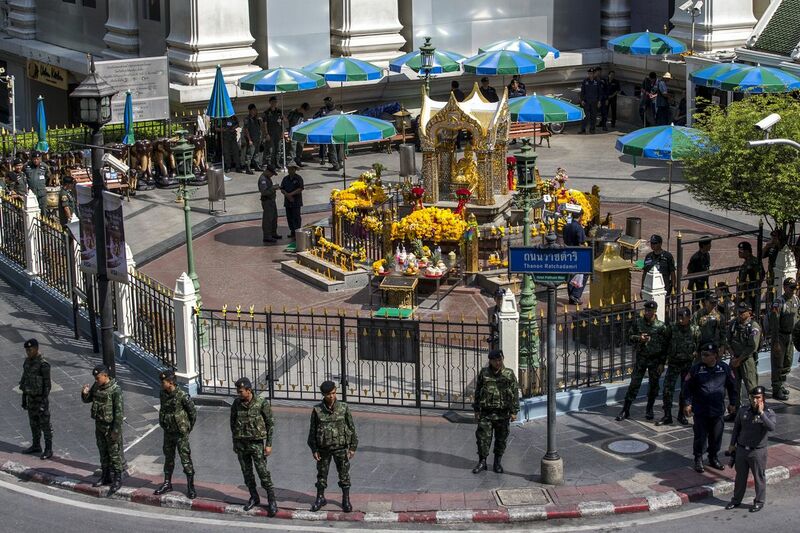 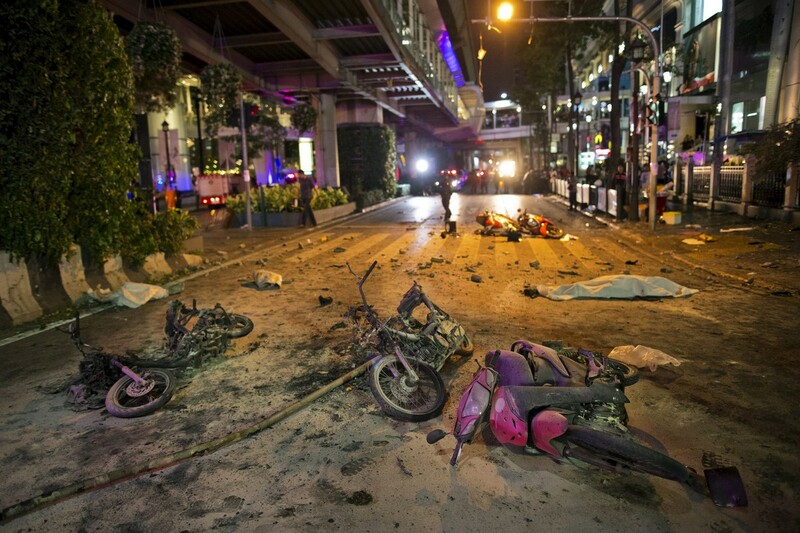 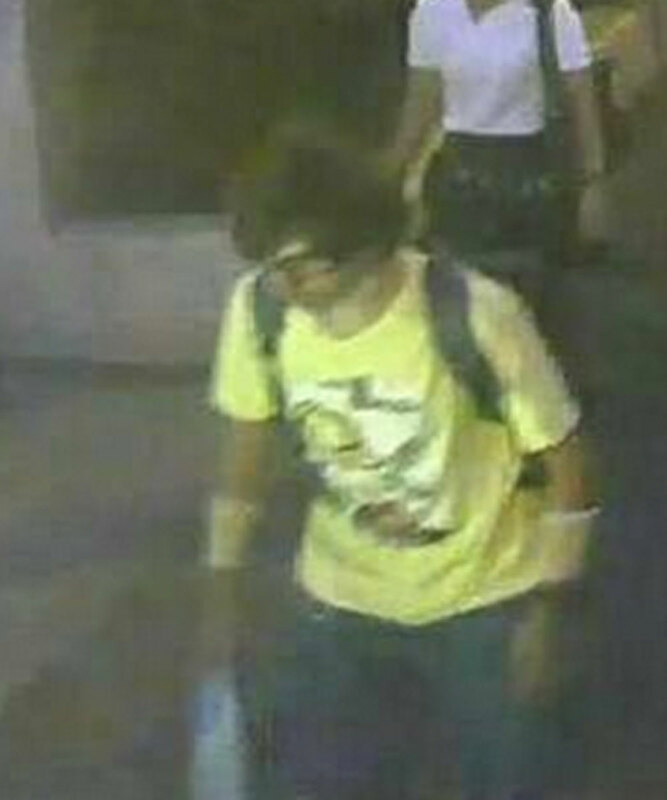 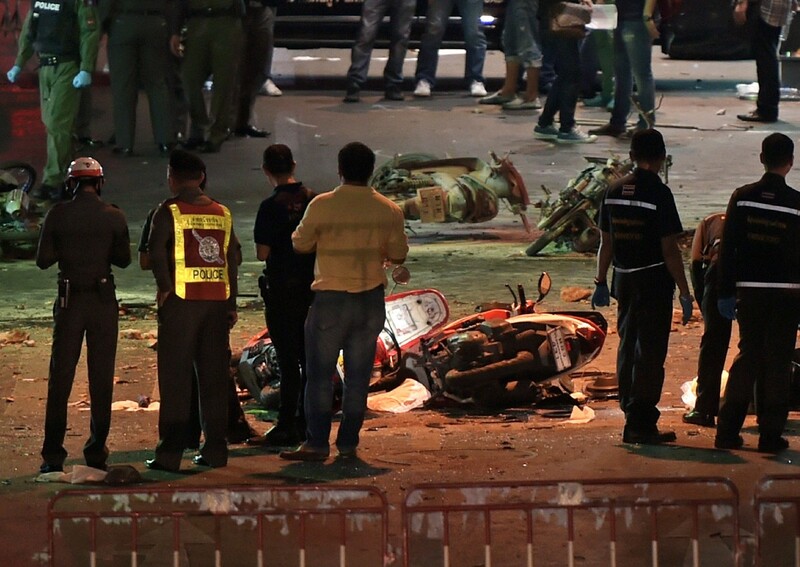 The bomb went off near the Erawan Shrine in Bangkok, killing 20 people and injuring more than 120. 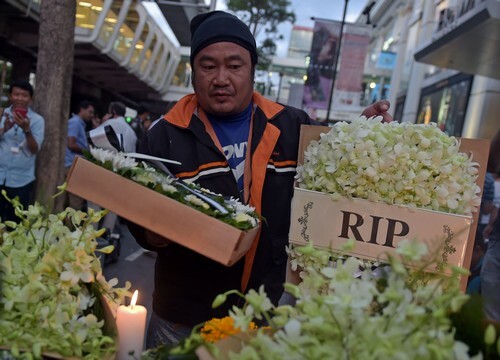 Deputy Foreign Affairs Minister Datuk Seri Reezal Merican Naina Merican who visited the fa­­mily said Malaysia strongly criticised the bombing. 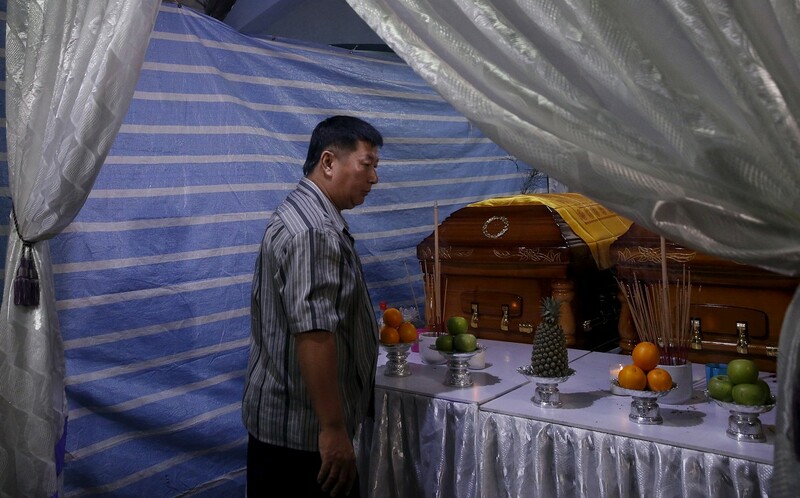 Family members of Neoh Hock Guan, a survivor of Monday's blast in Bangkok, look at the coffins of his wife and son who were killed in the attack. 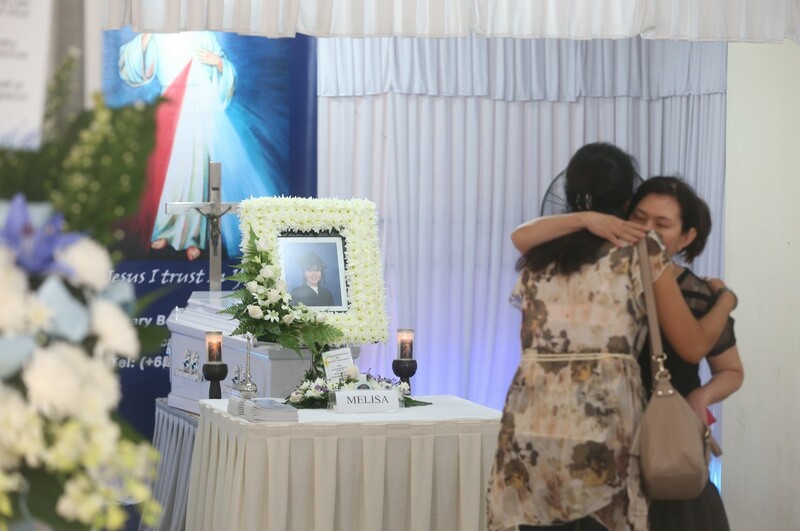 Earlier in the morning, Ms Liu's mother, Madam Katherine Woo, was beside her coffin when overcome with grief, she began to sob heavily. 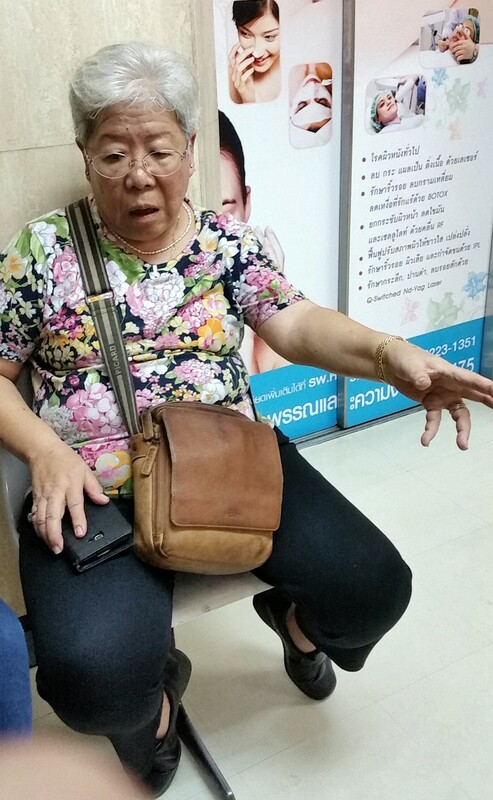 The 60-year-old sank into the arms of relatives who rushed to get her a seat. 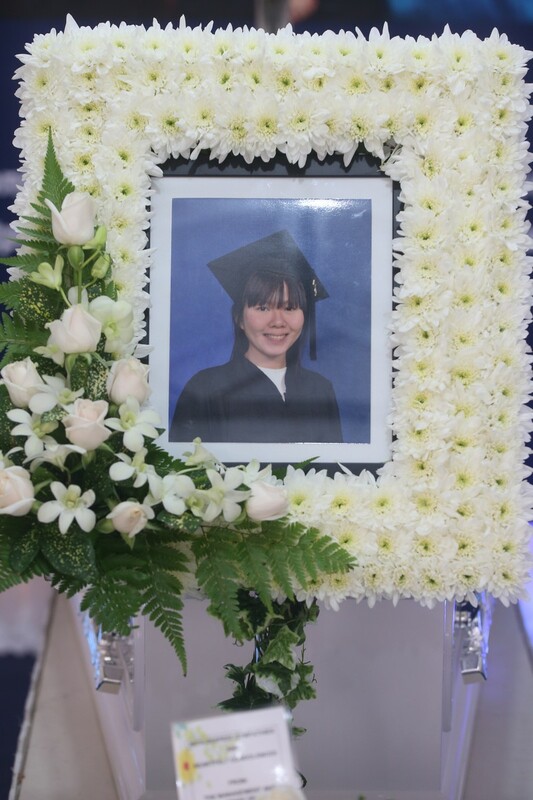 An uncle of Ms Liu's, who wanted to be known only as Mr Lau, said he had learnt of her death through reports in the newspapers. 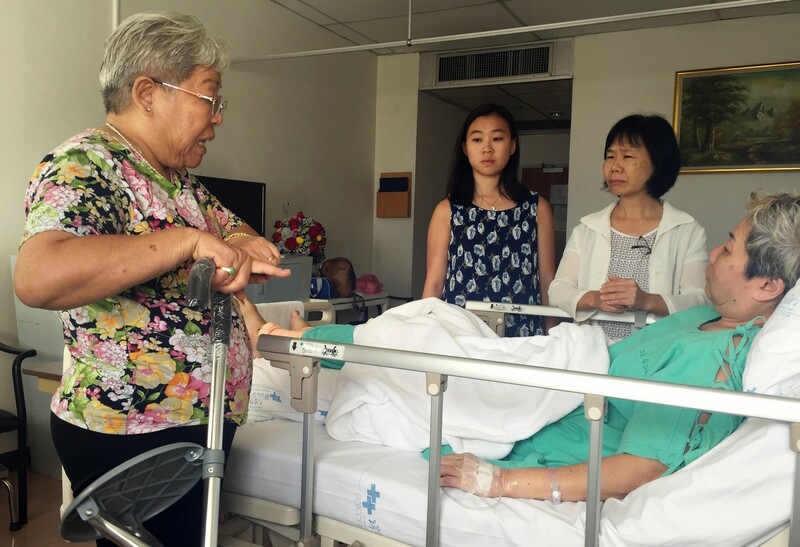 The 70-year-old had seldom seen Ms Liu and her family in recent years, but recalled how "when she was young, they would often come to my house". 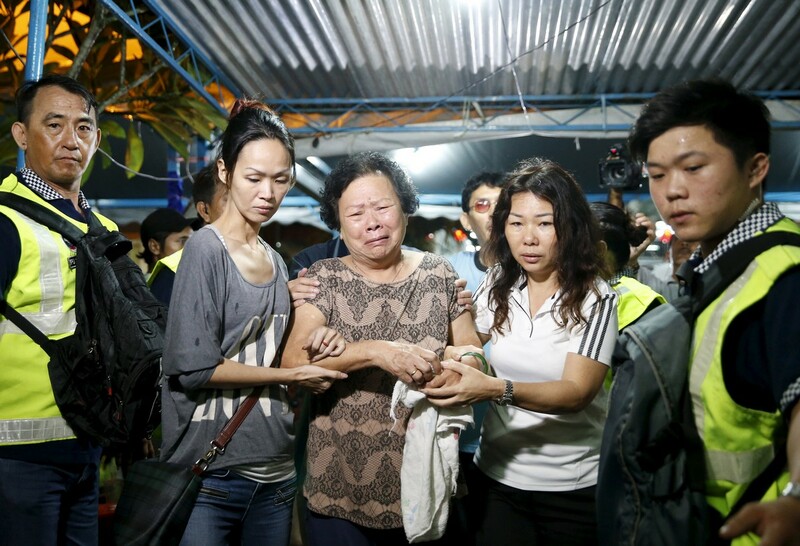 Ms Eleena Chew, 34, a close friend of Ms Liu's for more than 20 years, described her as "easy-going, always cheerful and rarely had a temper". 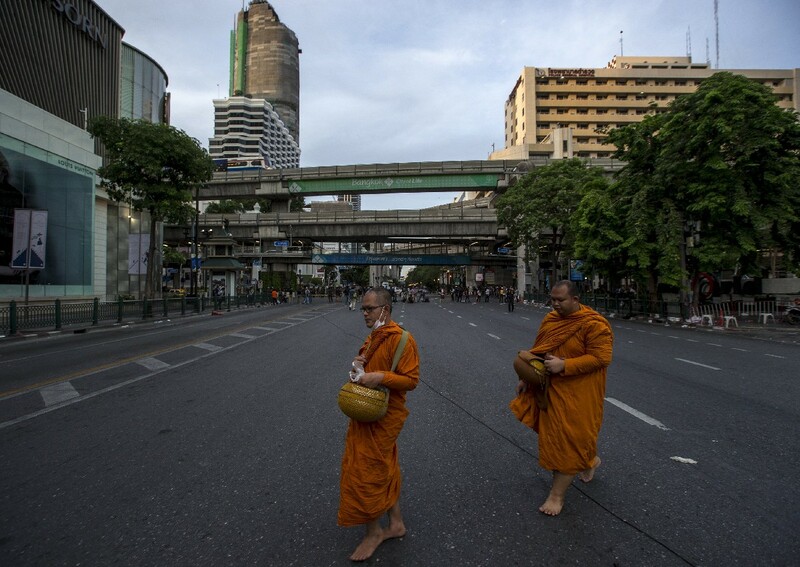 The pair enjoyed taking short trips abroad together and had previously been to Bangkok once. 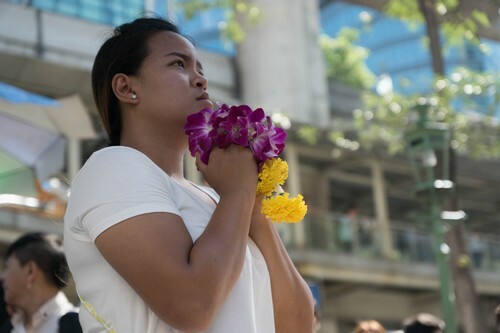 Later, family members and close friends wiped away tears as they walked behind the hearse while You Raise Me Up was played. 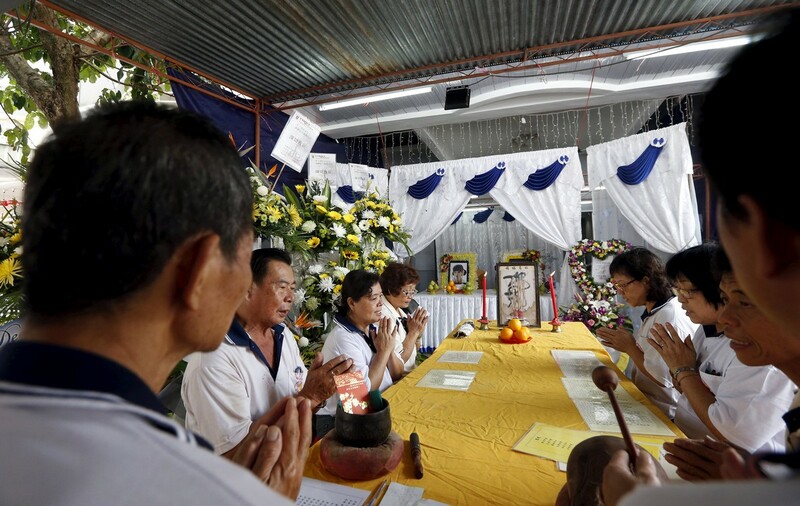 Some 100 mourners, including relatives, close friends and Ms Liu's colleagues at AXA Assistance, showed up for her cremation at 1.15pm. 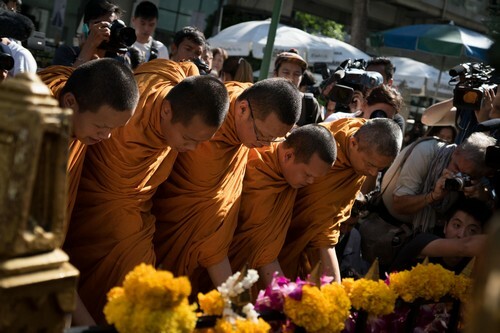 The mood was sombre as they paid their last respects. 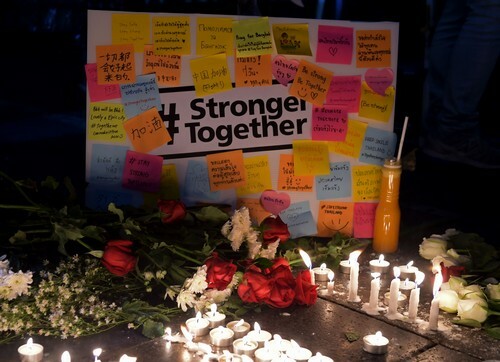 "It's still unreal for me," said a colleague, who declined to be named. 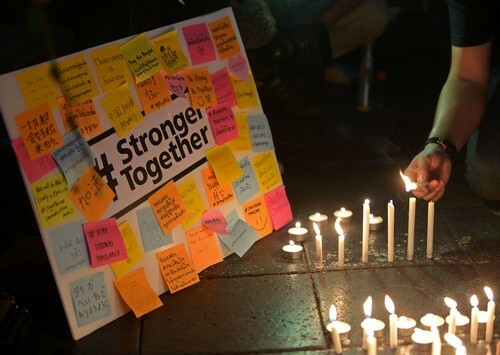 "It is all so sudden and still difficult for me to accept." 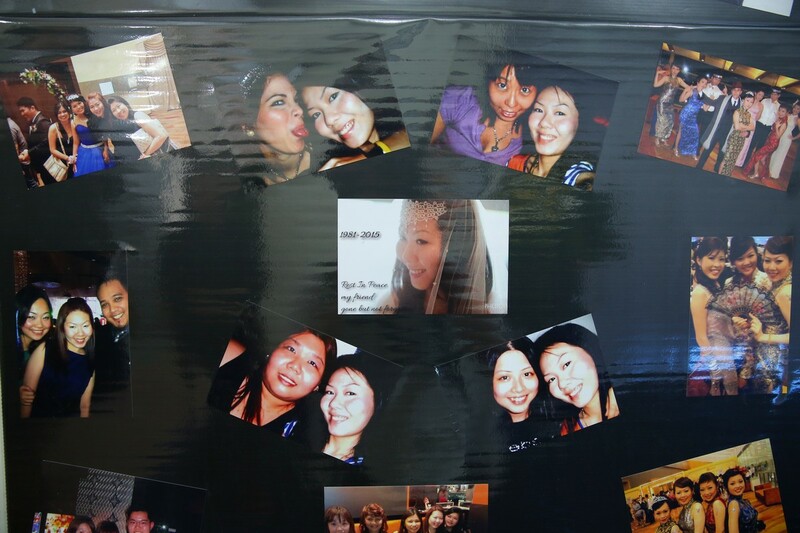 One of Ms Liu's friends said in her eulogy: "Melisa's death is sudden and it leaves an empty place in our hearts... 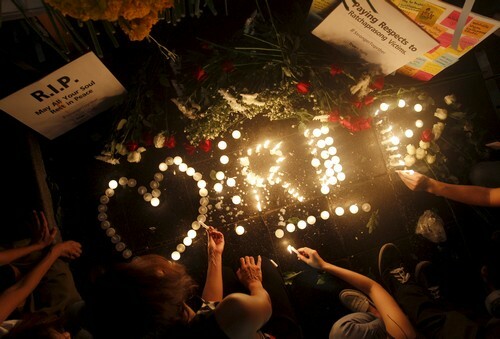 But this is not a time for us to cry... but a time to celebrate her life." 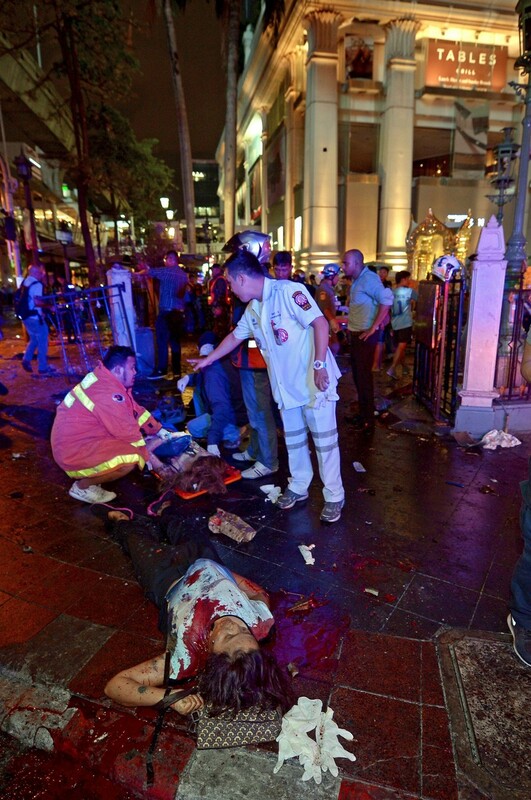 This article was first published on August 26, 2015.